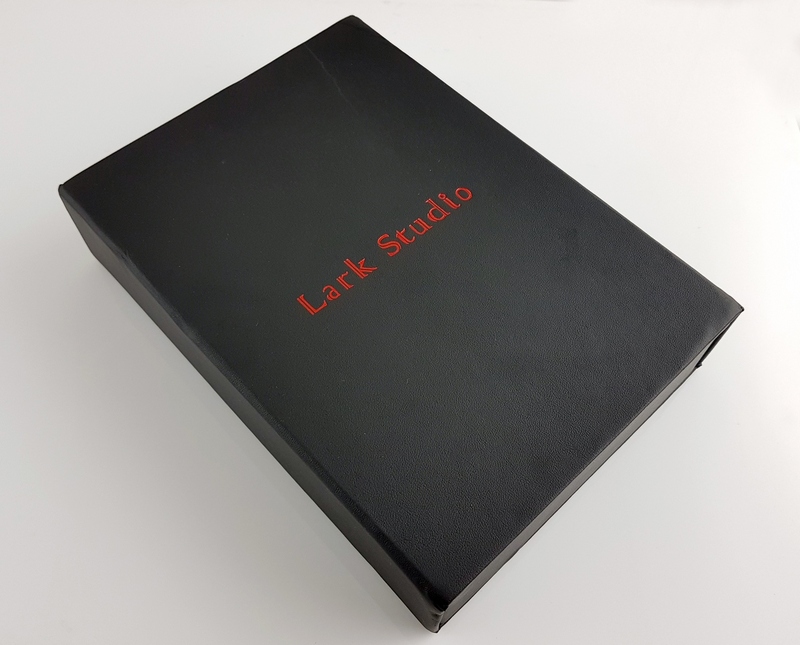 I didn’t know anything about Lark Studio until I was asked if I wanted to be put in contact with them by a friend in the review world over at Simply Audiophile. He tried to put me in contact with Lark Studios via Head-Fi and my email, but I never got any messages. Then the European distributor for Lark Studios contacted me to ask if I wanted to run a tour, and I noticed that I had an old friend request from someone with Lark Studios in their Facebook ID. With that we were off to the races. I’m the first up on the tour, in a change of pace from my usual closer position. Hopefully none of my review tour mates will read this too much, as I’m going full throttle here. Lots of comparisons, lots of variations in set-up, lots of work. After me, there are 6 more people signed up to the tour, so you’ll be getting a variety of opinions. The Head-Fi thread for Lark Studio can be found here. Each reviewer will have about 24 days to produce their review, with a loan time of 10 days. This should be a lot of fun. The Lark Studio LSX was provided to me on loan from Audio Concierge and Lark Studio as part of a review tour. 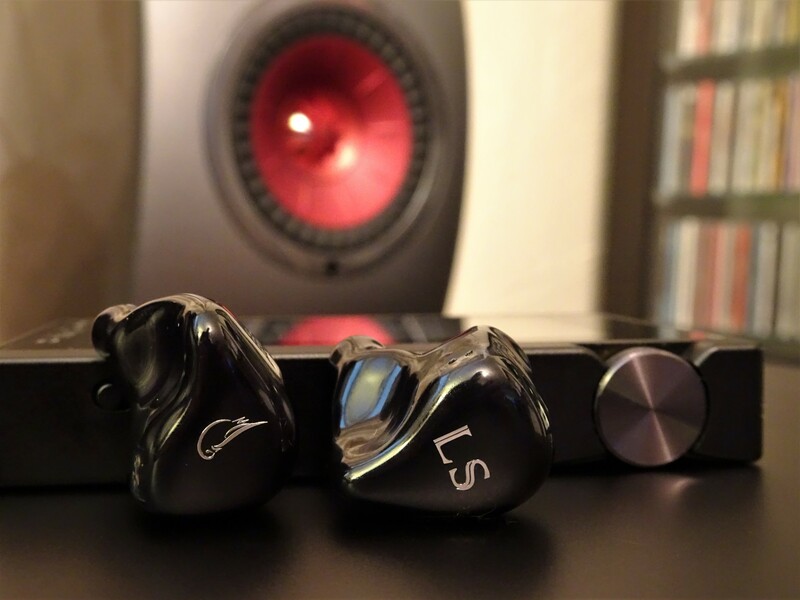 The LSX will be returned to Audio Concierge after completion of the review tour. I have received no compensation for this review. All thoughts in this review are my personal opinion. This review was originally published on Audio Primate. Our blog and so many others wouldn't exist without Head-Fi. We love this community and want to give back to it. 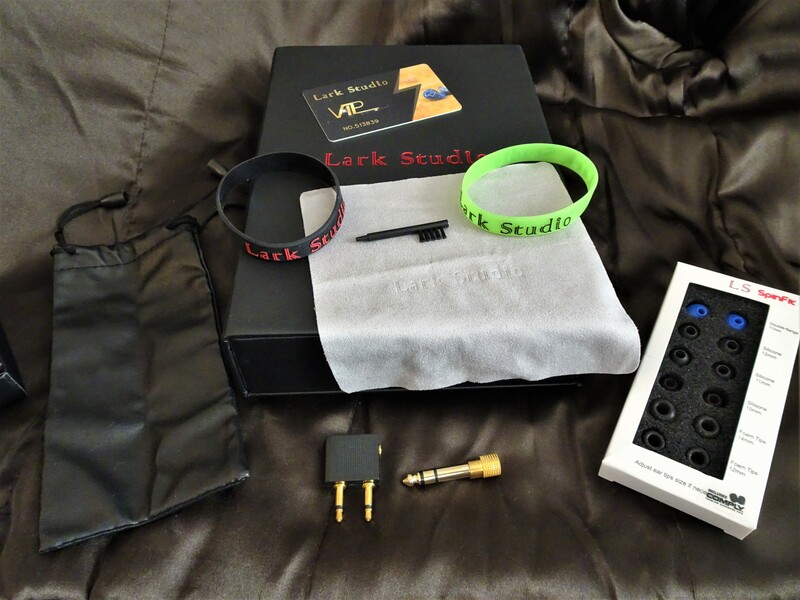 Lark Studio was formed by a couple audio-fanatics from other IEM labs. 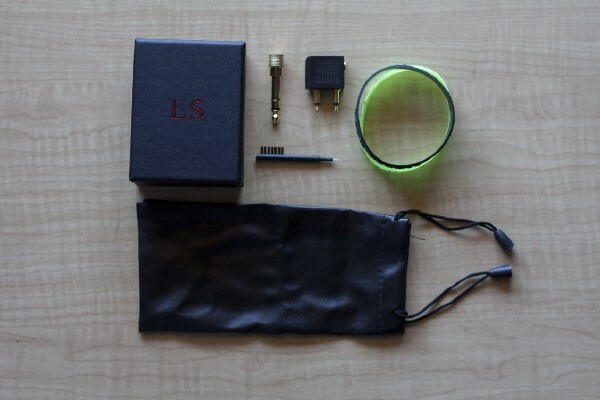 They’ve got a good deal of experience in the industry but the LSX is their very first product. The goal of the product was to get people’s attention, and it has. There’s a sprinkling of impressed reviewers all over the interwebs and it has basically wide-spread acclaim. The distributor told me that he thought it was a Noble Encore killer and better than the Unique Melody Mason V3 and Mentor V3—luckily I can test against all three right now as I’m still producing my Mentor V3 and Mason V3 reviews (stay tuned!). 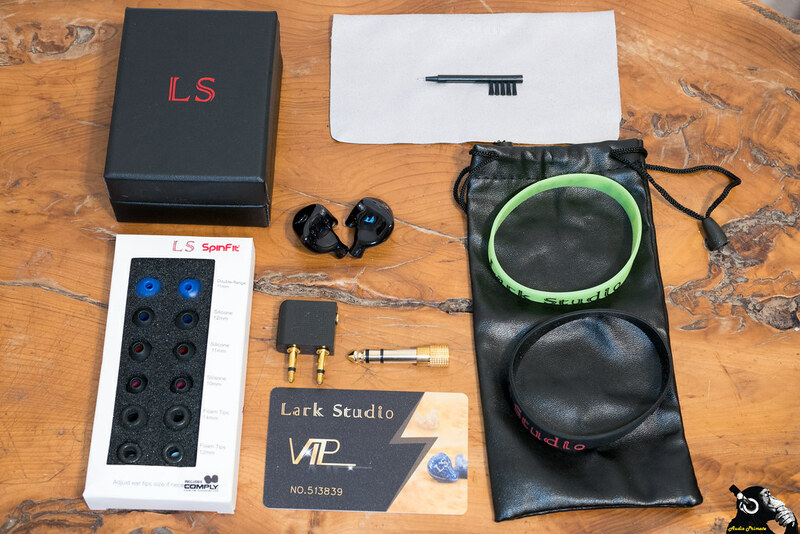 Lark Studio will have additional IEMs coming out in the upcoming year designed to appeal to different audiences than the fun-tastic LSX. A four driver with more of a reference tuning and a new 12-driver flagship focused on superior technical performance. 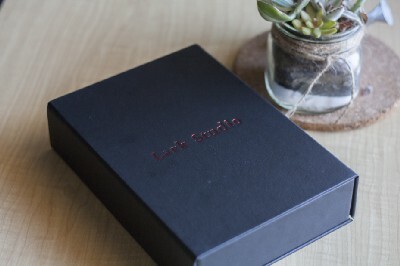 The LSX comes in a large-ish black box encased in a matt black card sleeve, the box inside the sleeve is emblazoned with Lark Studio in red on the outside. Th box has a magnetic clasp closure. It is of average quality. 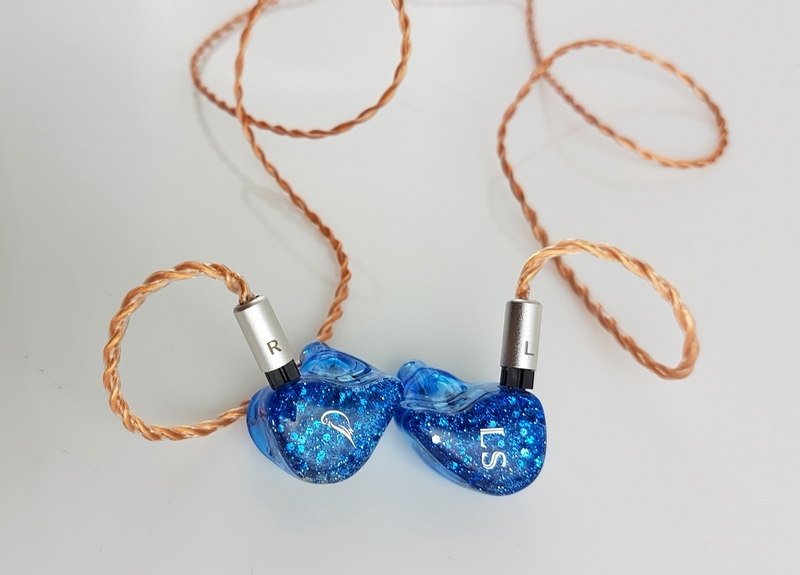 On the inside, the earpieces are shipped connected to the cable, which is a single ended copper cable from Rhapsodio. The cutout for the earpieces is twice as deep as it needs to be, which is why the earpieces in my picture are in little baggies. The depth of the cutout should be reduced. 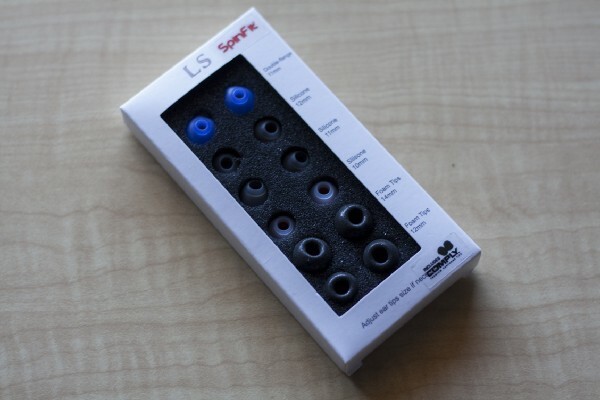 A large selection of tips are included with the LSX and sent in a display box. While there is a large variety, people with very small ear canals aren’t catered for, as there are only three tip sizes. Accessories include the ubiquitous airline adaptors and a 3.5mm to 6.3mm adaptor, both of which are displayed prominently. It always humours me when components that cost under $1 on the open market are displayed like prizes. I actually put one of these in a Christmas stocking once. I’m a mean one, Mr. Grinch. All the other accessories are inside a hard jewelry style cardboard box. 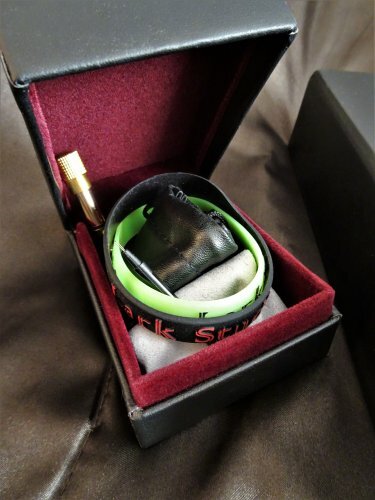 These accessories include: a faux leather pouch that is conspicuously long (looks like it is for children’s sunglasses), two amp stacking bands (I doubt people would use the LSX with a dedicated amp), a polishing cloth, and a cleaning tool. Ditch the amp stacking bands, faux leather bag, and the jewelry box. Make the box more compact. This may save the company on shipping. The 2-pin connector on the IEMs (female side) is completely external and leaves a tiny bit of the pins exposed. Having a slight indent into the body would allow for a more secure fit and would reduce breakage risk via stress on the pins. Even 1mm into the body would likely make a difference in the security of the connection while not changing the profile of the IEM at all. The sound bores appear on the nozzle appear to be directly drilled into the IEM body with white acrylic seen right behind the glossy black shine of the IEM, I anticipate that sound tubes in the internal structure lead to the very front of the IEM, with the rest of the distance traversed by the body. 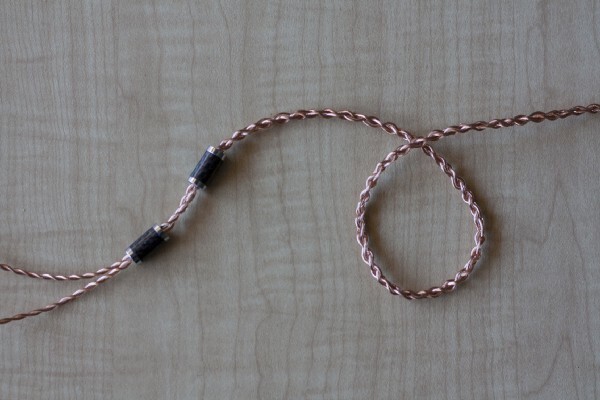 The included cable is a very nice what appears to be 24 AWG type 2 Litz copper cable manufactured by Rhapsodio. This cable was based on a retired Rhapsodio design and customised for Lark Studio. The cable is good quality with a nice lustre, but was not available in balanced terminations at the time of review. The company founders are looking into whether Rhapsodio will do this. The cable itself is very well built with a nice tight braiding all the way along the cable that gives it excellent flexibility. The terminations appear to be good quality and the 2-pin connectors have some grip to them instead of being metal slide-fests. Many cable manufacturers make the mistake of using polished chrome-effect 2-pin connector housings which are hard to grip when you need to. The cable is a really good cable. However, I think there is some risk in having a cable that is based on a retired design. 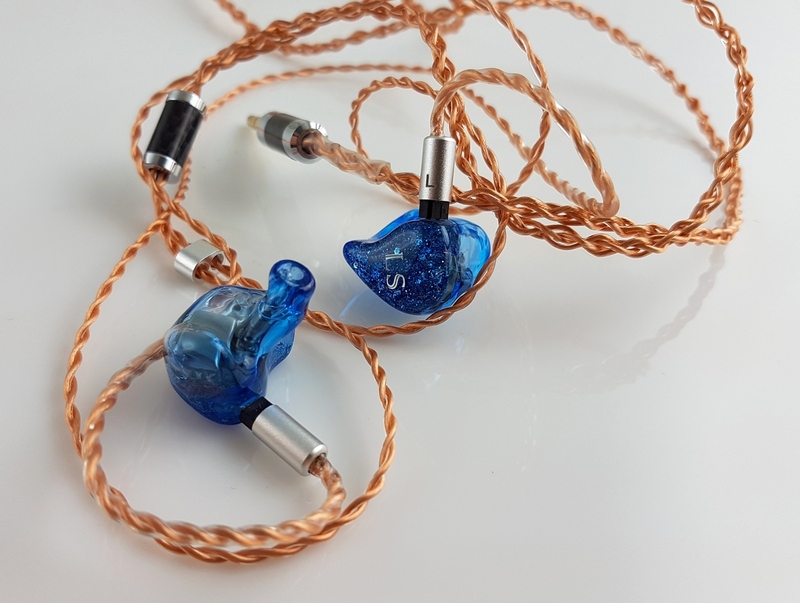 I would suggest that given that they already partner with PWAudio for the Saladin cable (SPC and copper, available in balanced, $200 extra on IEM price), they should consider striking up a full partnership with PWAudio, and maybe get their No. 5 cable in bulk. Just looking at pictures, the PWAudio No. 5 is not to the same build quality as the retired Rhapsodio, but predictable supply may trump the value of the Rhapsodio cable’s better build quality. The No. 5 cable is not likely to disappear in any significant way and may allow an even better partnership to form. 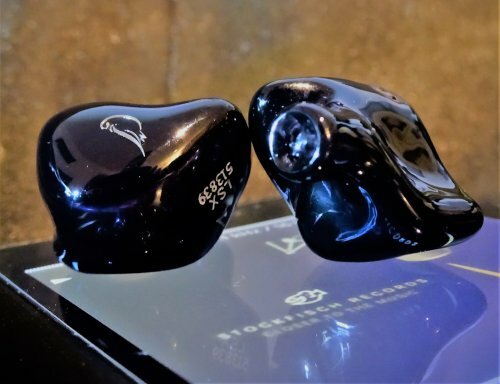 Manufacturers like Empire Ears and Jomo Audio already partner with Effect Audio, so clearly there is some benefit to be had from these partnerships for both sides. For the most part the Lark Studio LSX presents a pretty comfortable ergonomic fit. 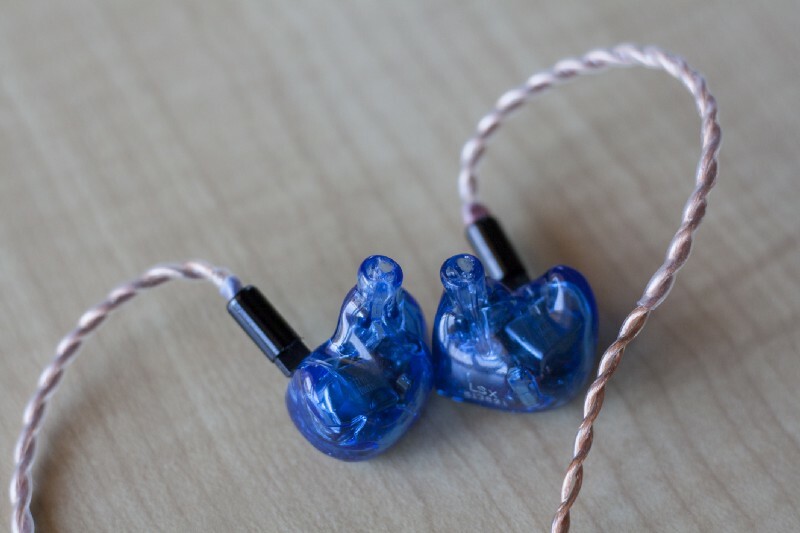 The size of the IEM is incredibly small for having an outlay of 10 balanced armature drivers inside of it. 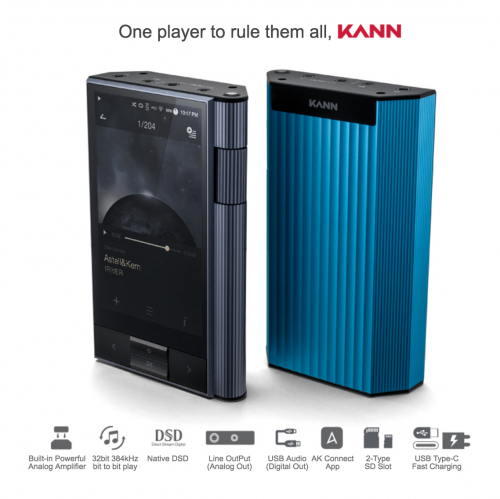 It is smaller and lighter than the Noble Encore (10 drivers) and the Unique Melody Mentor V3 (12 drivers) universal versions. The Noble Encore has a compact size, but the weight makes choice of tips very important as the tips have to have excellent stability and grip. I’ve found that the Final Type E tips are the best for the Encore and haven’t had slippage problems since switching to the large versions of these. The included Spinfit CP155 & CP230 (bi-flange) and the Comply T-500 tips might be the only tips that really fit the nozzle of the Lark Studio LSX, so your tip choices may be limited to what is in the box. Given that I’m not into a hugely warm sound, I knew immediately from my CP155 listening that the tendency of the Comply foams to attenuate treble and ramp up mid-bass would not be to my liking. My final tip choice was the CP155. These are long flange tips that can isolate really well if you give a little tug on the top of the ear and wiggle the IEM. The ergonomics of the included cable are excellent. In my experience the best type of earguide is a light preformed ear-guide that has a tiny bit of spring to it. 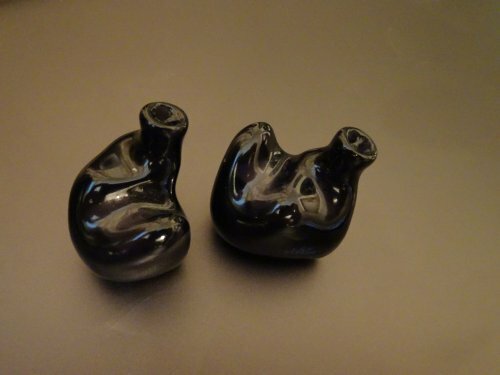 These types of earguides fit to the ears without causing pressure. They don’t have the extra bulk and pressure points of memory wire, and they don’t have the sheer mass of solutions like what HiFiMAN do with the RE2000 Silver (and Gold) wherein they have an external massive plastic rubber cradle for the cable that basically nobody would ever find comfortable on their ear, especially with glasses. In other words, the earguide on the Lark Studio LSX is just about perfect. The LSX has a fun signature with a healthy helping of bass and warm sound. It has smooth treble while still having good detail in the mids. The mids are silky smooth and inviting. Bass is present, but has a focus on the mid-bass, with less prominent extension than some other in-ears. The bass gives some dynamic driver like impact and has a long decay. 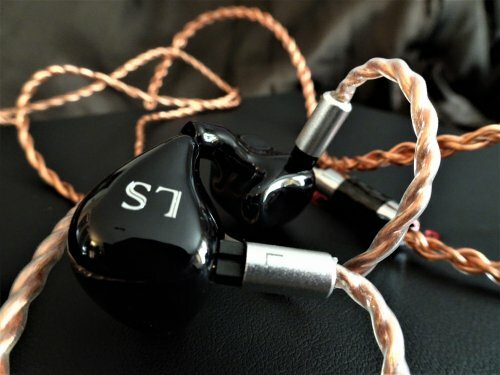 The soundstage is average to a little below average for the price point and has a notably forward signature that causes some reduction in depth. When I did initial listening test with the Questyle QP2R I did so straight out of the single ended jack. When I went to do my comparison work with the Noble Encore, it wasn’t possible to do the Noble Encore with it’s stock cable from the single-ended jack as this would result in excessive warmth in the midbass and likely some hissing—I’d previously observed these when working with the Noble Encore. So to tame the mid-bass bump I went and grabbed the Ultimate Ears Buffer Jack with the thought that this would work just like the iFi iEMatch 2.5mm worked to make it so I could use the Encore with the QP2R. It worked. This also made me think that the QP2R may have been causing extra bloom with the LSX, so I tested. It was. When listening to Wilco – Handshake Drugs (16-44) I noted that the bass in the intro was better controlled with the buffer jack and that the mids were a hair clearer. I think that there is improvement in the treble/upper mids that leads to enhancement of the bass and mids. The differences weren’t huge but were noticeable. With Daft Punk – Instant Crush (24-88), the bass drum remains palpable with the UE Buffer Jack and the bass guitar is a touch tighter. Mids are also slightly more forward giving better sonic balance with the placement of the bass. On Pink Floyd – The Thin Ice (16-44) I note a little more stage width with the buffer jack and that same improvement in bass control. Without the buffer jack the bass on Macy Gray – Slowly (24-192, binaural) overshadows Macy Gray’s voice a bit. The buffer jack brings better balance and also gives cymbals better presence. QP2R with buffer jack was my preferred sound, but there will be plenty who crave the additional warmth that I was looking to tame, so your mileage may vary. I didn’t observe hiss with the Lark Studio LSX on the QP2R at all, with or without the UE Buffer Jack. The sound from the SOUNDAWARE M2Pro without buffer jack sounded indistinguishable from the QP2R plus buffer jack, which was good for me, and confirmed my belief that the current mode amplification was affecting the sound on the QP2R without the buffer jack. The M2Pro is a fantastic sounding player, but the QP2R is much easier to review on and sounds virtually identical, so the QP2R is the primary reviewing rig for this review, with accessories. I found the LG V30 to drive the LSX just fine, but also found that it had a little bit extra warmth compared to what I get from the SOUNDAWARE M2Pro or the Questyle QP2R plus UE Buffer Jack. I tried using the buffer jack with the LG V30 and it did mostly fine but sometimes clipped in the treble region. This led me to listen mostly without the buffer jack when using the LG V30. 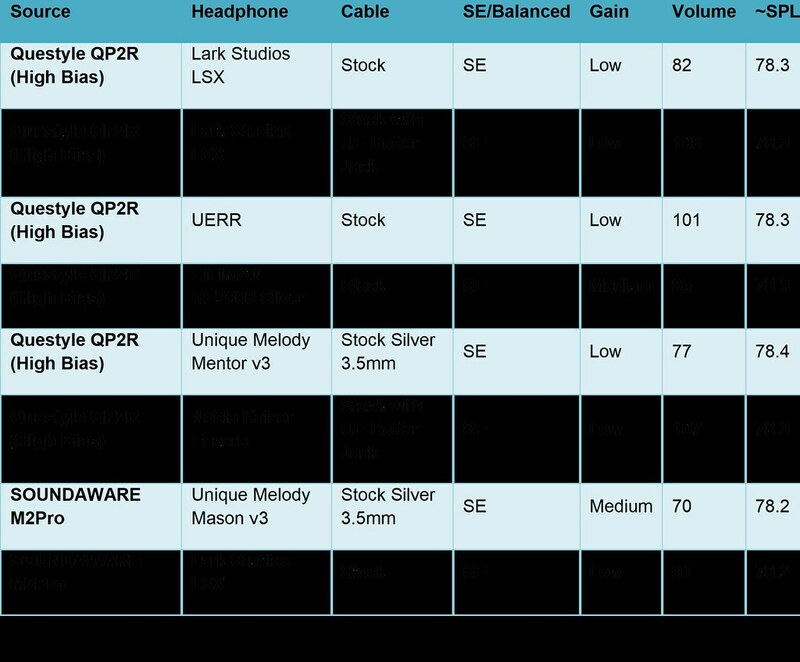 The cable that comes with the basic Lark Studio LSX is a Rhapsodio cable and isn’t available in balanced implementation. 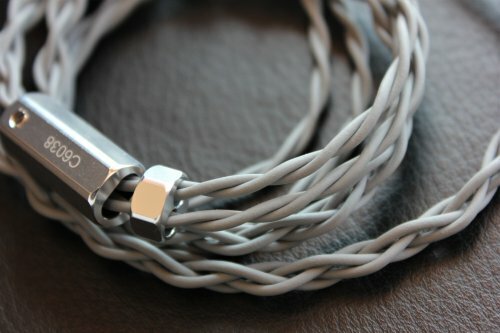 Lark Studio does offer a balanced Cable made by PWAudio called the Saladin for $200 more, which is an increment that is less than if you bought the cable on it’s own. Unfortunately, Lark Studio did not send the review unit with a PWAudio Saladin, so testing alternative cables will fall completely outside of those offered by Lark Studio. 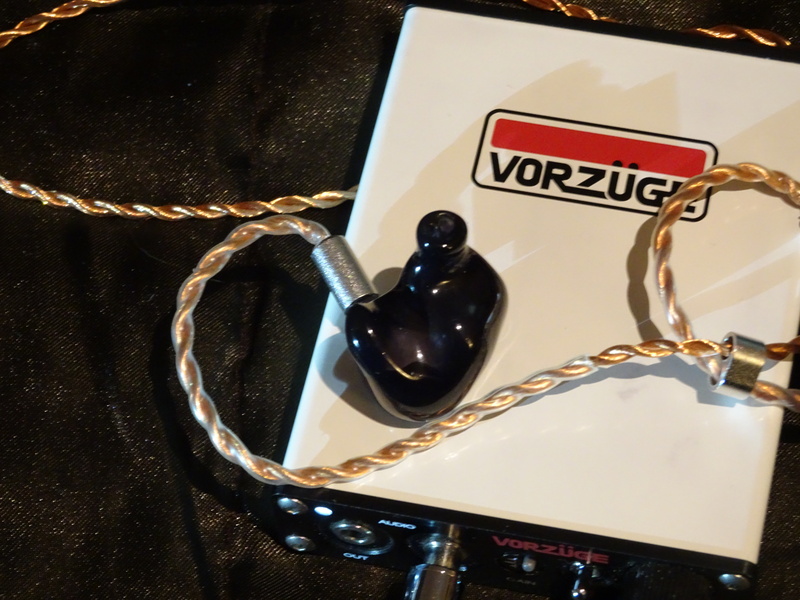 In order to compare with the stock Rhapsodio cable I ran each balanced aftermarket cable through a 2.5mm to 3.5mm convertor and then used the UE Buffer Jack hooked up to the single-ended output on the QP2R. I’ve previously identified that there are no significant impedance mismatches between the cables through volume matching, which means when I do cable tests I don’t have to volume match, I just need to be super quick on my switches so that the miniscule differences are noticeable. Cable switching runs huge risks of confirmation bias and I can’t guarantee I’m immune. The ideal situation would be to have two identical IEMs with different cables playing out of a neutral splitter. There would be next to no lag time. As is, my lag time is generally around 30 seconds, which is pretty fast when having to pull out 2-pin cables re-insert new cables and then get the IEMs in ear and play. 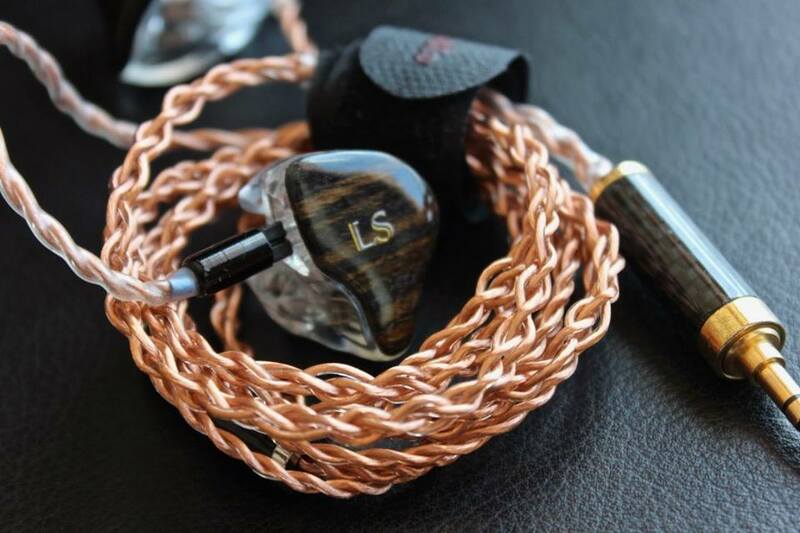 I really like the pairing of the PlusSound X-Series Gold-plated copper (GPC) cable with the LSX, the primary effect of the PlusSound X-Series GPC that I’ve noticed is a strengthening of the middle of notes which gives them a little added focus and smooth transients. It pairs very nicely with the LSX, just as it does with the Noble Encore. The most expensive accessory I have in my review cave is the Double Helix Cables Symbiote Elite SP (8-braid). 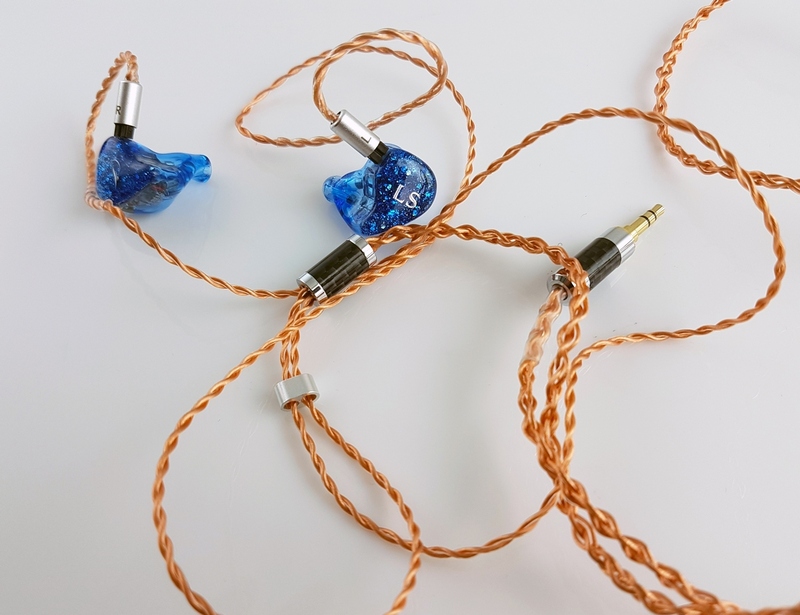 I don’t recommend most people spend their money on an $800 cable if they can spend that money on a better DAP or headphone, but it absolutely makes a difference in terms of maximising performance of a high performing IEM. Bass is a touch smaller but tonally the same with the Symbiote Elite SP when listening through the extended intro of Isaac Hayes – Walk On By (DSD64). Sound stage has a bit more width and depth. The stock cable is a touch warmer, but most of the warmth is coming from the tuning. Switching to Saturday Looks Good To Me – Sunglasses (16-44), bass is a touch tighter with the Symbiote Elite SP with little difference in bass presence (less), but the bigger difference is the openness of the stage. The elements in the stage have better definition and there is more overall space in every dimension (height, width and depth). This is my favourite pairing. Switching up to balanced amplification with volume matching (vol. 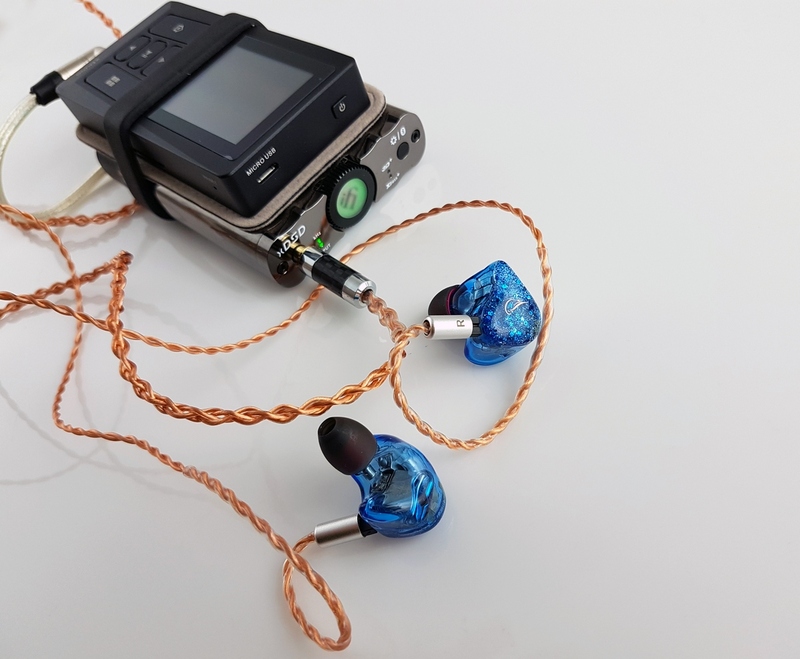 98, 78.4 dB) on the Questyle QP2R with the iFi iEMatch 2.5 gives a small incremental boost in the characteristics the cable is already revealing. The wire isn’t adding anything, it’s getting out of the way. All comparisons were done using stock cables with some use of the UE Buffer Jack where necessary. Volume matching was done using white noise and an SPL metre. I provide this information so that if people want to do the exact same comparison, they can repeat my observations without an SPL metre. Repeatability is the heart of scientific enquiry. The UERR has a bit of extra thickness in the lower parts of Damien Rice’s voice in Elephant (16-44). The Lark Studio LSX presents Damien’s voice with more delicacy and air while packing a touch more emotional payload. The LSX carries Damien’s breath a little better and makes the track that much more intimate. That said, the UERR has greater stage height. With the LSX I get some absolutely beautiful fine level bow on strings detail on the cello when it’s in isolation. Bass presence is lower on the UERR. Both accurately convey the somewhat distorted mastering of the flurry of activity near the 4:30 mark in the track. The UERR captures a tiny bit more treble detail from the strings than the LSX. The LSX is giving me big beautiful groovy bass out of Blue Oyster Cult – (Don’t Fear) The Reaper (DSD64). The bass is forward of neutral, but without disappearing the mids further back in the stage, which gives the song a very engaging sound. It also ensures that the cowbell and guero aren’t lost in the stage. The stage depth is somewhat compressed to accomplish the engaging sound, but for many this will be a worthy exchange. The UERR has a bit more depth, with more separation of instruments. This make the UERR a fine tool for monitoring a mix. I don’t think I’d use the Lark Studio LSX for that kind of spatial accuracy intensive activity. The LSX gets the timbre of instruments right, but placement isn’t as honest as a reference monitor like the UERR. That isn’t what the LSX is designed to do. Personally, I get great enjoyment out of precision over power. This is reflected in my day job as a health economist, also. I’ve spent several days looking at Hierarchical Related Regression, and the potential for more precise measurements of effect using all available information from a variety of trial designs has had me practically giddy. The UERR fits my precision desire on this track with its fantastic instrument separation. The Lark Studio LSX has a warmer more emotive feel with towering bass. Saturday Looks Good To Me – Sunglasses (16-44) begins with a big satisfying rumbling artificial bass that the LSX delivers up in full glory followed by a chunky electric bass guitar line and and two widely panned guitars. The track is busy as heck and the LSX’s 10 drivers are keeping up well. This poppy fun track perfectly matches what the LSX does well. The UERR doesn’t get the bass volume or the bass feel. It’s a tight controlled bass with excellent depth, but without the presence or body of the LSX bass. The rest of the sound is more open and precise sounding, especially the rocket fire clap sounds. On the UERR every element of the track can be picked out with precision, which is where the fun comes from. Everything is presented honestly on the UERR and it elevates my favourite album of 2016 (Saturday Looks Good To Me “One Kiss Ends It All”). The LSX has intoxicating bass, but the UERR has intoxicating scientific precision. The variable depth of instrumentation in Isaac Hayes – Walk On By (DSD64) is an impressive recording feat. The UERR is all over the depth with the intro sound effects dancing all over the stage. Swells of strings come in at markedly different depth than the bass guitar and the backing vocals. The tapestry is full of little details. The LSX sounds darker, warmer, and less detailed with less stage depth. Isaac Hayes’s vocals come in like smooth brown butter with the LSX. Violins are silky. There’s romance to the LSX sound. Sometimes a little romance makes up for a short deck in terms of depth. The UERR has more of every dimension of stage size (height, depth and width) but the technical precision won’t necessarily set the mood in the same way that the LSX will. The LSX, for a warm sound, doesn’t sacrifice much in the way of mids clarity, which is unusual. It has a pretty good balance of tone and technical performance. The tone is really good. I like both a lot. Given my particular listening preferences, I’d probably pick a UERR style signature on more days, but if I want to listen to pop or hip-hop, or any bass-driven music, my choice may very well be the LSX. OutKast – Ms. Jackson has a lot going on, for real. The RE2000 Silver has some great menace going with the bass guitar, with tight funky plucks. The multi-tracked layered stage is well presented with individual elements easily discernible. However, each element is not entirely distinctive, which will be a function of the treble levels on the RE2000 Silver. With the Lark Studio LSX the underlying bass in the background is pushed forward. Compared to the drum power on the RE2000 Silver, the bass drum kicks you in the face on the LSX. The LSX, in spite of the bass emphasis, still provides extraordinarily well textured bass. The bass on the LSX is a lot like dynamic driver bass. 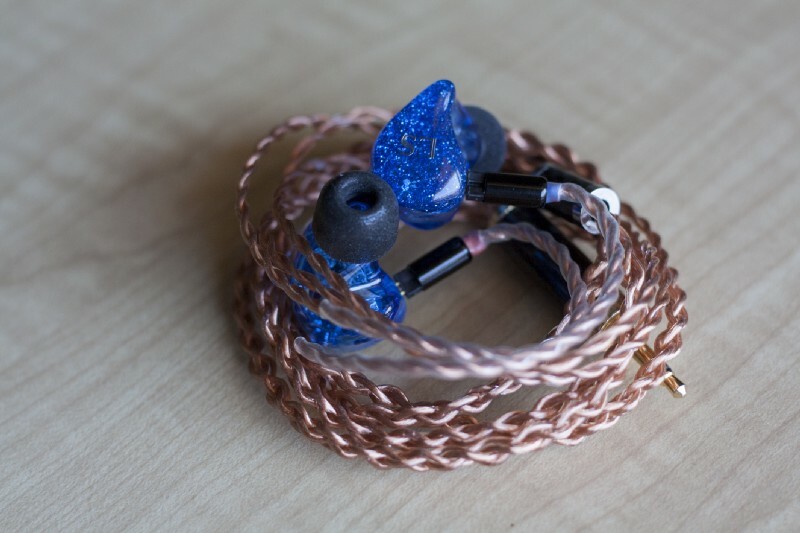 It actually is bass that you feel, which is rare in fully balanced armature IEMs. The lower mids and upper midbass have a warmer sound on the Lark Studio LSX. Soundstage on the LSX sounds a little wider than the RE2000 Silver on this track. Individual elements in the stage also feel a bit more distinct with better instrument separation. The sound of the LSX is actually a bit reminiscent of the RE2000 Gold but with better build quality and a bit more separation in the mids. Piano in the intro is less forward as the mids of the RE2000 Silver are a bit back of neutral. This placement of the mids tends to make the sound stage sound a bit deeper. The LSX sounds forward in general due to the elevated bass and the pretty normal emphasis mids. Both IEMs are fun sounding with natural timbre. The RE2000 Silver has a more neutral sound than the LSX, which is a bombastic but lovely sounding number. On the RE2000 Silver the recessed mids make Michael Jackson sound like he is way deep in the stage rather than in the middle of it on Michael Jackson – Billie Jean. The LSX has a more front row sound, while the RE2000 Silver sounds like it is further back in the crowd. The RE2000 Silver crowd is a more civil affair, whilst the LSX is a party. 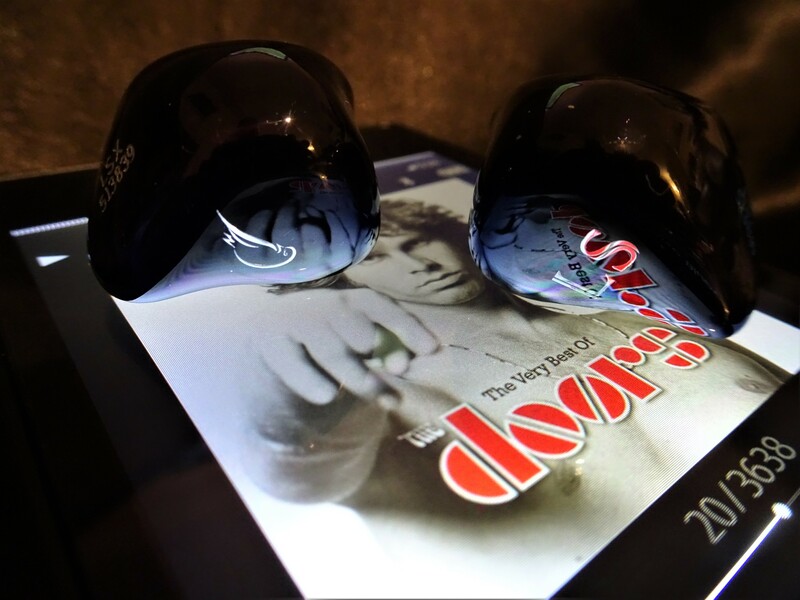 The RE2000 Silver is Coldplay (civilised and moving), and the LSX is Bruno Mars + Beyonce (absolutely ridiculously fun). The Lark Studio LSX has Michael where he should be, right in the middle of the sound stage, rather than pushed back. It also pushes bass forward of the mids, which is off of neutral. The bass is big on the LSX. Both do an excellent job of resolving instruments in space, but the LSX’s better formulation of the mids gives more flexibility for instruments that occupy the mids to move deeper in the stage. The RE2000 Silver presents Kuniko – Pleiades: I. Melanges (Mixtures) with a nice even keel. Nothing sounds over-emphasised or out of place, whether it be xylophone, tympani, or chimes. The increasing aggression of the sound at about 2 minutes in builds beautifully. The LSX gives a similar performance, but the whole sound is more front row than 3 rows back of the stage. The LSX easily goes toe-to-toe on timbre, and might be a bit more sonically precise. Soundstage size is a push, but soundstage positioning is definitely different. The bass is most definitely forward when I throw Wilco – Handshake Drugs on with the Lark Studio LSX. It’s a bit too much actually, as the bass is competing too much with Jeff Tweedy’s vocal in the intro. It slinks back a little bit later while still having some presence, like the bass guitarist moved back towards the drum kit or like Jeff Tweedy moved forward in the stage. The bass is tighter and more controlled on the RE2000 Silver, but also has more perceivable extension. The perceived increase in extension is because the Lark Studio LSX has some added mid-bass that throws the deeper lows out of balance when deeper bass instrumentation and mid-bass and upper mid-bass are present. The RE2000 Silver sounds better on this track, though I do still find myself wishing the little bit of recession in the mids wasn’t there. The breathiness of the RE2000 Silver really suits Tori Amos’s vocals on Hey Jupiter, in my opinion, as it gives even more fragility to the presentation. Some will find the sound sibilant as the breathiness also imbues more weight to her ‘sss’ sounds. In contrast, the LSX presents Tori a bit more solid and rounded with less emphasis on her breathy ‘sss’ sounds. The piano is also more accurately placed right next to her singing. The Mentor V3 provides a clear and well delineated presentation of the Rolling Stones – Salt of the Earth (DSD64). Each instrument has great spacing around it. Bass has great tone, but not huge presence. Turning the dB-Go switch to closed enhances bass impact slightly. The female vocal chorus has individual vocals that are separated without much difficulty on the Mentor V3. Right off in the track, guitar and vocals are more forward with a nice organic sound on the LSX. The overall sound is more forward on the LSX. Bass has a lot more presence and sustain. The decay on the mid-bass is a touch long, the Mentor V3 is faster. The LSX trades some precision for increased presence. The overall stage depth is reduced on the LSX with the presentation more like two closely arranged planes rather than several layers as with the Mentor V3. Billy Cobham – Quadrant 4 (DSD64) is the Speedy Gonzales of music tracks. The Lark Studio LSX keeps up well for the most part but smooths over a bit of detail on bass and treble. The Mentor V3 is faster and more open sounding with individual drum beats resolved more completely with less blending. The presentation is a bit more distant on the Mentor V3, whereas the LSX puts you right in the thick of it. Bass is tighter on the Mentor V3, but less present. The Mentor V3 is the technically superior performer while still being fun. If a more forward signature is what you are looking for, the LSX will likely suit better. The Mentor V3 also has the ability to switch cables without buying a new cable. 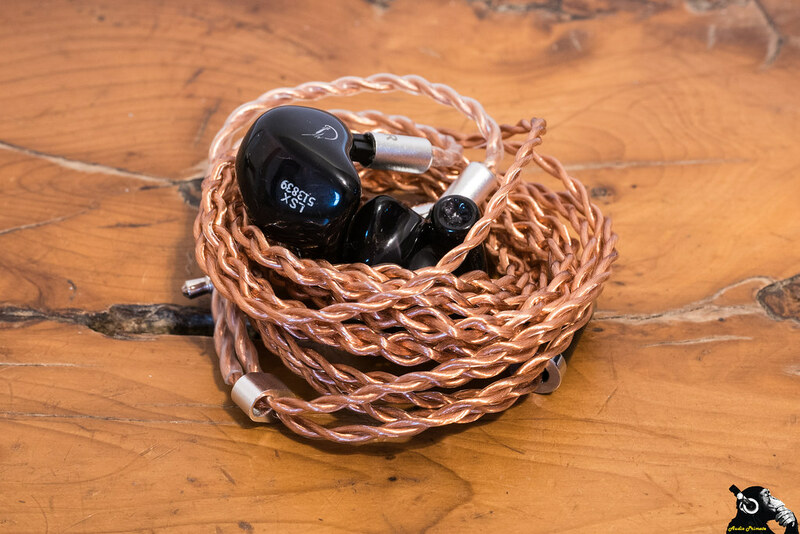 Switching to the copper cable gives a more forward sound that is like a more controlled version of the LSX with less bass slam. With DB-GO open on the Mentor V3, the vocals on Daft Punk – Fragments of Time (DSD64) are airy with good clarity. Bass is back in the stage with good definition. Treble is forward on the Mentor V3, but not as forward as the vocals on this particular track. Decay on the variety of cymbals is good on this track. When switching to the LSX, the bass is huge with good texture on the lower notes and dynamic driver like depth, but with a hint of bloom. The ambiance is great on the LSX with a bit more decay in both the bass and the treble. The extra decay is primarily in the midbass for the bass section of frequency response. Vocals sound great on both, just more forward on the LSX. Switching from silver to copper on the Mentor V3 brings the bass forward a little, but it still has the same tight controlled presentation. The LSX has a little extra ambiance. I think people will enjoy both sounds. One has to recognize that they aren’t trying to do the same thing. The Mentor V3 is a fun-reference tuning, while the LSX is a fun-fun tuning with big bass and smooth emotive mids. The Mentor V3 is less fun in all its set-ups vs. the LSX, but is a better technical performer all-around. I think most folks listening to Fragments in Time would pick the LSX as the signature fits pop music really well. Norah Jones – Feeling the Same Way (24-192) has a beautifully delicate presentation with the Mentor V3. The wide-panned guitars are very well defined, the central stand-up bass and the piano and drums at the back of the stage are just delightfully distinctly presented. Mmmm delicious in silver with dB-Go open. The LSX is warmer and softer, with a less wide stage. On this track I prefer the Mentor V3. The LSX slightly compresses the stage depth and slows down the activity in the track some. 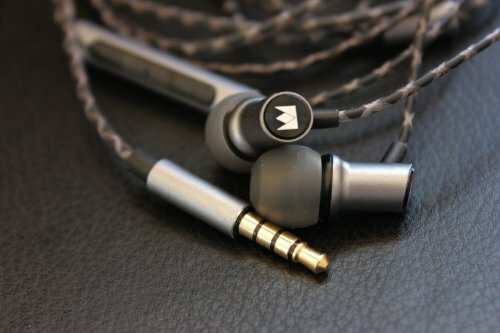 The comparisons here were done on the SOUNDAWARE M2Pro as the Mason V3 doesn’t sound quite right out of the single-ended output of the Questyle QP2R. The Mason V3 really lays out the stage beautifully on Macy Gray – Annabelle (24-192, binaural). The distance between the band members feels like a real stage with Macy sitting a bit back of the bassist and the lead guitarist, while the drummer sits well into the back slightly left of centre. On the LSX, bass and Macy Gray’s vocals are slightly more forward, but Macy’s vocal sounds a bit stuffy. The Mason V3 sounds cleaner and clearer on Macy’s vocal, and overall on this track. The cymbals sound like there is a bit of a haze between them and the listener on the LSX. The LSX out does the Mason V3 on bass weight with dB-Go open and closed, but the gap is less when the dB-Go module is closed as this gives a bit more weight. Metallica – Master of Puppets (24-96, Vinyl Rip) has great speed on the Mason V3, but a slightly more forward sound usually benefits metal, and the Mason V3 isn’t a front row kind of IEM. I find myself wanting it louder on this track. When I jack up the volume a bit that sounds more like it. It can certainly make it sound like I want it to. Bass extension is good on this track, but there isn’t any emphasis, so these could be interpreted as bass light with the dB-Go open. Closing the dB-Go gets a bit more bass ambience and makes the sound a bit heavier in general. The desire for additional loudness is repeated on the LSX (this is just a quietly recorded track). Vocals feel a tiny bit more distant due to some emphasis in the lower mids. Doing a similar volume boost works on the LSX also. The cymbal taps on this track have longer decay on the LSX, in contrast, the Mason V3 sounds a touch fast on the cymbals on this track. Guitar solos sound smoother on the LSX, but more refined on the Mason V3. Why? – Strawberries (16-44) with the LSX has some big nicely textured bass. It gets some serious slam in the intro. Yoni Wolf’s vocals sound nice and silky with the LSX. Instruments have good layering. These work really well for this highly active alt-rap track. Nice sparkle in the percussion too with the LSX. The Mason V3 does just as nicely with Yoni Wolf’s vocal. Bass comes in with really nice definition, but the slam is less palpable on the Mason V3. Percussive elements like the maracas or the clapping are more in balance on the Mason V3. The sound isn’t as fun on the Mason V3, but it is probably more honest to the recording. Fans of hip-hop will probably prefer the bigger bass of the LSX. There is some voice echo in Tori Amos – Silent All These Years (24-96, Vinyl Rip) in the verse vocal sections that is very subtle and soft. The Mason V3 does an excellent job picking this minute detail up. The vocals on the Lark Studio LSX are more forward, but it doesn’t pick up the echo vocal with quite as much definition. It’s still there, but I can’t pick up the full resolution of the vocalisations. It’s like it’s half there. The LSX is louder in the mids and has a silky texture to Tori’s vocals. Piano has a slightly softened timbre on the LSX. Low notes on the piano have slightly exaggerated body on the LSX. Cello has similarly lengthened decay. On the Mason V3, stage depth is deeper, but mids are also presented deeper. Cello and flute are more precise and correct sounding on the Mason V3. The violins have a beautiful soar to them. Tori’s voice isn’t as silky on the Mason V3. Low piano notes and cello are more controlled on the Mason V3. With the Mason V3 the silver cable gives a leaner presentation, as does having dB-Go open. 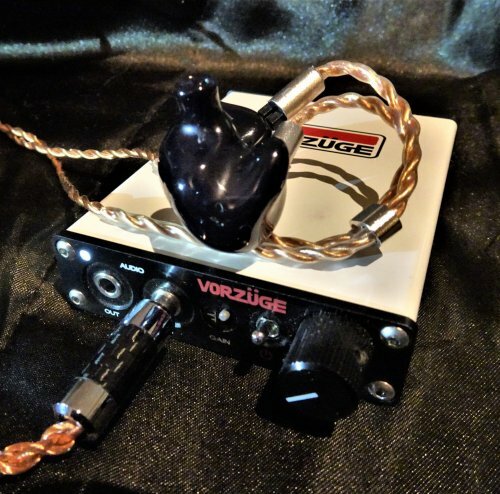 When dB-Go is closed and the copper cable is engaged, the Mason V3 retains a resolution advantage on the LSX, but has a closer tonal presentation to the LSX. The LSX still wins on bass impact, and still tends to have silkier sounding vocals (vocals depend on the singer). The Mason V3 is more flexible, and more technically proficient with the accompanying sonic precision, but is not as emotive as the LSX. 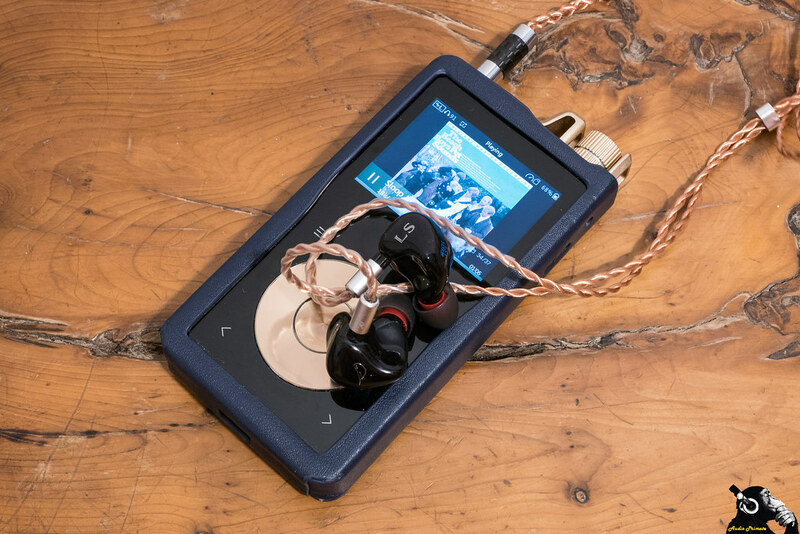 It’s worth noting that most times that the Encore appears in my reviews, I’m using the PlusSound X-Series gold-plated copper. For this comparison, I was using the stock cable. That cable could use an upgrade to its pretty basic standard. It had been a long time since I’d listened to the stock cable. On Pixies – Where is My Mind? (DSD64) I’m not quite getting the soar in the female backing vocal that I’m used to with the LSX. The sound of the soaring vocal is somewhat distant and slightly concealed. On the Kaiser Encore the soar is bigger. However, bass doesn’t extend as deep and drums strikes aren’t as tactile. Both the LSX and the Encore have some elevation in the midbass, but the feel is better on the LSX. The LSX and Encore have different points of emphasis on the upper mids. The Kaiser Encore emphasizes higher frequencies in the mids more while the LSX goes lower in the upper mids. This gives the Encore greater soar and air, while the LSX has more richness and body. Both are good sounding so signature preference will probably determine which is preferred rather than any measure of objective superiority. The Noble Kaiser Encore is smooth on Leonard Cohen – Leaving the Table (24-44) when it comes to the bass and his vocals. The backing strings have great weight and texture. Bass extension on the Encore is somewhat muted. The deeper frequencies are present, but the overall tactile sound isn’t. This is pretty normal for fully balanced armature setups. They don’t normally push enough air to make you feel the bass. In contrast, the LSX accomplishes something really rare in balanced armature setups, you feel the bass. It also extends lower. Leonard’s voice has more body on the LSX and more texture. Strings are a touch less precise on the LSX than on the Encore but have a nice fullness. Full is a good way to describe the LSX sound. For this track I think the LSX has a more pleasing presentation. 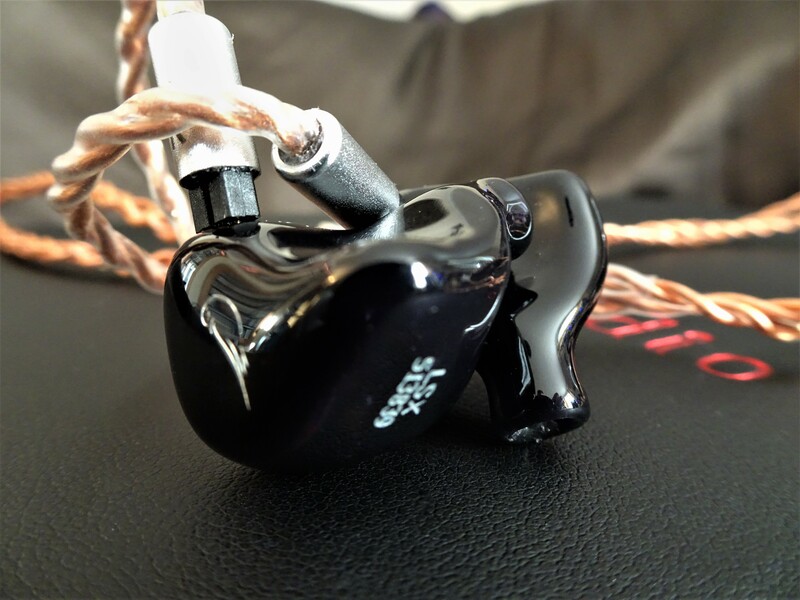 The tactile feel of the bass is a big accomplishment for a $1699 fully balanced armature IEM. The $4k Vision Ears Erlkönig gets bass feel like this, but this is remarkably rare for balanced armature setups. It’s very impressive. The presentation of the cymbals is a strong point on the LSX. Many balanced armature setups have sharp cymbals with tight attack and decay that sounds just a touch unnatural. The LSX extends that decay a little. On Natalie Merchant – Carnival (24-96) mids sound thick through Natalie’s vocals on the LSX. Bass drum impact in the intro is impressive on the LSX. On the Noble Encore, the bass isn’t big but it has a tightness that lets a bit more funk develop. The space in the stage and instrument separation are better on the Encore. Natalie’s voice isn’t as rich as the LSX but it has greater texture and depth. The organ in the upper mids has better dimensionality with sound extending well from back to front of the stage. Layers in the stage are easier to pick out on the Noble Encore. The organ presence is greater in general on the Encore—it’s that difference in expression of the upper mids again. Stage is a touch narrower on the LSX. The LSX presents the sonic landscape of King Crimson – Lizard (16-44, Steven Wilson Remaster) brilliantly. It has a very natural and organic sound. Jon Anderson (of Yes) sounds more delicate on the Noble Encore, and a touch more forward. The percussion is a bit more fulsome on the Encore due to its frequency placement in the upper mids/lower treble. Upper midbass is also slightly more forward on the Encore. The overall sound is fuller on the LSX. 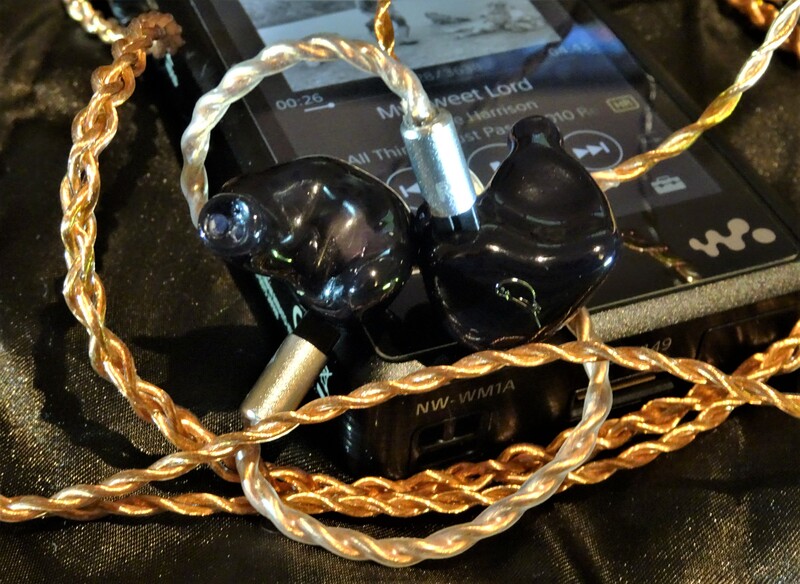 Both IEMs have good sustain on the tubular bells. As expected, bass body is bigger with longer decay on the LSX. Both the Noble Encore and the LSX are fun signatures. The Encore is a bit more balanced, while the LSX has more emphasis on the lower end and more warmth. Treble has more emphasis on the Encore. 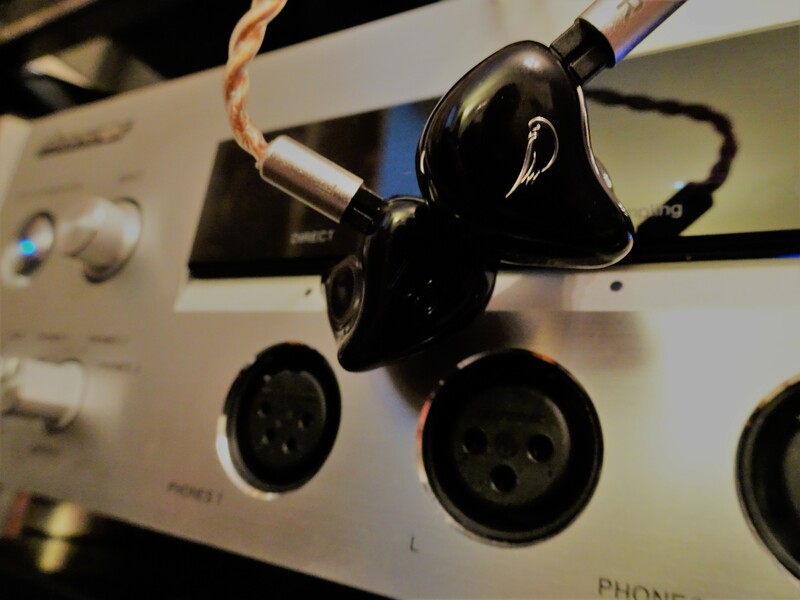 The Encore has better technical performance in the treble and upper mids, while the LSX has better technical performance in the bass. 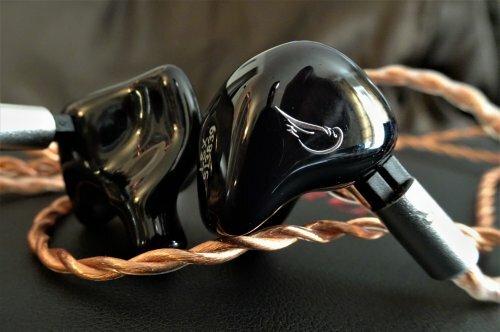 Both are excellent IEMs, that I’d be happy to reach for frequently. Your sonic preference will determine which one you like more. The LSX is slightly better value for money. Accessories Spinfit CP230 Bi-flange (S), Spinfit CP155 (S/M/L), Comply T-500 (M/L), protein leather display case, protein leather travel bag (oddly shaped), 2 armbands/amp stacking bands, airline adaptor, 3.5mm to 6.3mm adaptor, cleaning cloth, cleaning tool. The LSX provides a rich, lush listen with a focus on the bass and the mids. Treble performance is smooth without losing much in the way of mids detail. This full BA setup has accomplished a rare feat of presenting with bass that is very close in impact and feel to a dynamic driver set-up. The sound is warm overall with a healthy serving of midbass. For $1699 for either custom or universal the LSX has a very good value proposition. If you are into a warm sound with big bass and lush mids, this one’s for you. Pros - Well tuned non fatiguing resolving balanced range sounding IEM, pairs with variety of different sound sig sources. very efficient to drive, comfortable, full-range supplied accessories. free custom artwork. Cons - On sound, could be bigger soundstage and another notch up on the tightness of bass control. Presentation & packaging design and non protective storage pouch. universal price could be a bit lower? 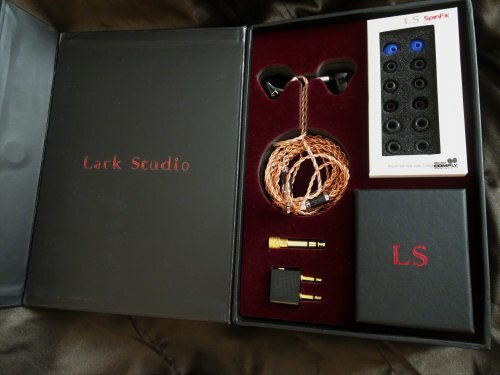 Firstly I would like to thank Lark Studios for organising this tour in conjunction with Audio Concierge for the opportunity to be able to listen to these in the comfort of my own living room for ten days to put them through their paces and let me give my impressions on the Lark Studio LSX Universal IEM. It’s been a while since I’ve done a review on Head-fi as it has been a busy year for me in general but when this opportunity arose and worked out I would be off over the Christmas period to give them the time they deserved to listen to them in depth I thought why not? I’ll be honest in saying I had not heard of Lark IEM’s until this came about so was going to be an unknown quantity to myself as usually in the past most of the items I would review I already had an interest or curiosity about that said item in what it sounded like as had already known about the product but yet the Lark was an unknown to me or what specie of in sound these IEMS actually were. I’ll be honest from the outset and say I have tried a few IEMs in the past year or so as I have been looking for a potential replacement flagship for my JH16’s and I know I can’t quite afford the mouth-watering but as equally stunning sound of the JH Layla’s or the stunning Obravo £3K+ range to date. I had heard plenty of others ranging from the £1-3K mark and I am finding as good as many of them sound they are just missing that X factor in the sound for me or sounding a bit too similar to each other at times and I am referring to the IEMs that are in the realms of a 65-75 inch 4K OLED panel! I currently am using now as my main go to IEM the Vibro Labs Maya which went largely under the radar to a degree which was tuned by Luke Pighetti who sadly is not in this game anymore which just shows how competitive this market is now days and is more busy than ever the domain of IEMs whether Universal or custom fit. The Maya is a quad BA driver Maya that strikes the cord in the signature that I fell in love with when I reviewed them a couple of years ago and ended up buying a set which cost $599 when they was out and for me has given a lot of good IEMS up to the £1K mark a run for their money so I was finding it hard to find something to takes it’s mantle so to speak in my eyes especially in the mids with the Mayas deft but exquisite mid detail retrieval despite the Maya fit been one of the more awkward I have ever encountered in a universal IEM using the bigger 600 comply bore tip size really lets it down and wished now I had it turned into custom when I had the chance by Luke. So for me at the moment it has been about finding a flagship IEM that could replace my beloved Maya sig whilst improving on it technically without costing the astronomical amounts flagships have moved to as their ceiling price last few years whilst currently I am on a more austerity budget in this hobby to what I used to be whilst my good wife starts up a new business from scratch after redundancy so for now I cannot think of stretching to the “super £2.5+ iems” of this world for now. The pair I had for review was as can be seen in photos is a black looking face plate finish with the LS branding on one plate and the Lark bird logo on the other side with a smoke transparent shell so was not able to see that well at any of the driver workings which is a shame yet from what I could see it had a good finish to the casing and the supplied standard copper cable is very pliable and non-microphonic with a standard straight 3.5SE plug and 2 pin fit for the earphone end. 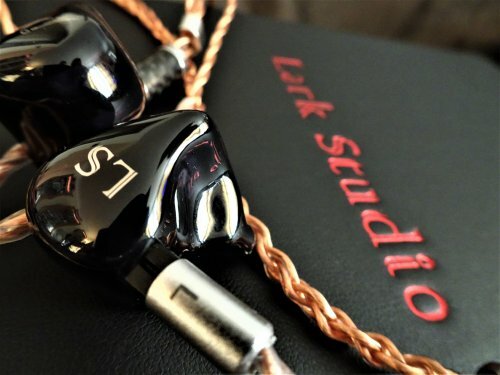 One of the unique selling points that will be tempting is Lark do not charge for artwork on their iems. The shell on this universal LSX on first inspection thought they looked maybe a bit big and maybe cumbersome considering it has to house 10 drivers somehow into each ear and bearing in mind everyone’s ears are different it will always be your mileage will vary depending on your ear shape. I happen to have small ears, so I was told by my Audiologist when I had my first ever ear impressions done for my JH16’s back in the day but the Larks actually fitted in my ears quite well without sticking out or feeling awkward to fit in and most importantly felt comfortable over long listening sessions staying anchored in pretty well even though it doesn’t feel like it takes much for them to just slot in the ear compared to some other IEMs which can be more time consuming to twist and fit in just in the magic perfect place. 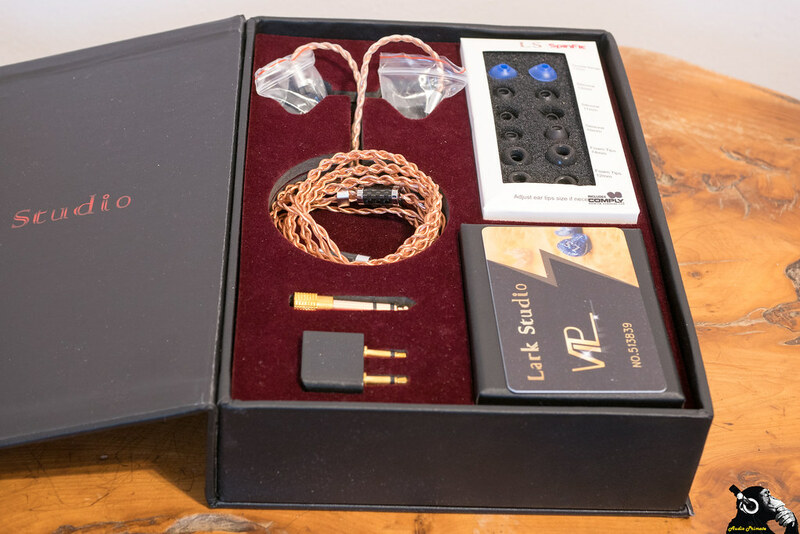 The Larks come packaged in a hard sturdy presentation box with the LSX IEMS and the accessories laid out in the laser cut foam cut out sections. Comply/ Spin fit tip pack of multiple sizes and both foam and silicone tips. Only thing for me here which does gripe at me a bit and couldn’t ignore in the end… as sturdy as a job it is doing is the packaging, storage box design and storage pouch supplied with the presentation case red foam cut out for everything it seems out of place, almost dated in design and more like an old jewellery box which I know some far eastern companies in the past have been a bit eccentric with their style and design which is very reminiscent to this Lark offering here also when it comes to the storage box & travel storage pouch. 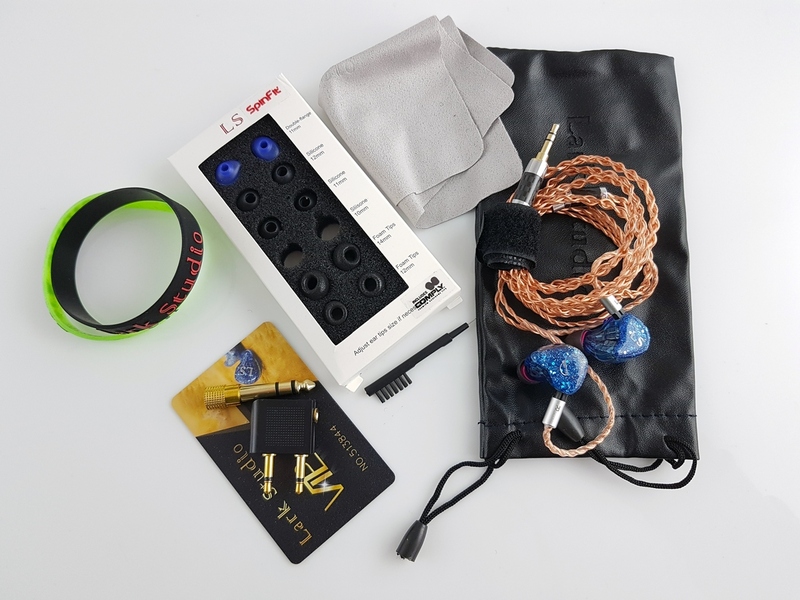 For example the supplied drawstring pouch is not a suitable for on the go storage solution to protect a $1700 IEM and feels more like a token gesture as I do wonder how many people will use this pouch for its intended purpose?. For me the overall design and packaging does not reflect the quality of the IEMs themselves and now been familiar with the Lark build and sound quality think a package that encompassed the design styling of say the way Oppo, Meze or RHA or even Flare manage with their design on mid entry products and packaging of their products goes a long way to helping the perception and over all eye to detail of a company’s overall cohesion of a product from conception to finished article which would be icing on the cake if they could give the overall product a more classy and sophisticated modern approach with a travel storage solution that has purpose to protect the said IEM’s when we are still talking above $1600 for a flagship IEM. I know the company is starting in its formative years as a new company on the block and hopefully in time they will be able to evolve the level of design and imagination on the packaging and travel case storage ideas as the company grows bigger with popularity and sales. Not knowing at all what Lark’s values were on the sonic side in terms of sound signature I must admit I had some trepidation on what the tuning of the LSX was going to be like as to start with I have sensitivity with treble with overly bright/ harsh IEMs on the top end plus I am not a fan of having the mids sucked out so the treble and bass dominates too much the overall zen balance of an IEM. 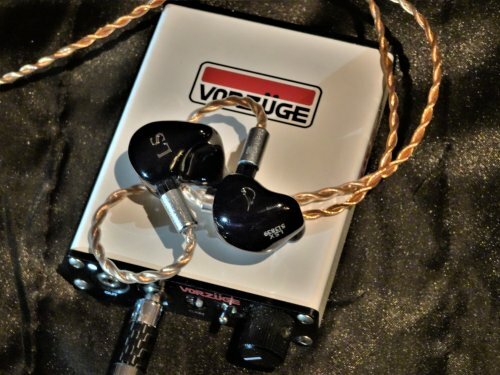 In the first minute of putting the LSX in my ears they immediately aligned any fears I had of getting an aggressively harsh over bright or sibilant treble or sucked out mid-range tuned IEM. My first actual worry if any from my first brief encounters on listening with the LSX actually; was the bass going to be too dominating over the rest of the sound spectrum?... Scroll down to bass header for that more elaborated answer. 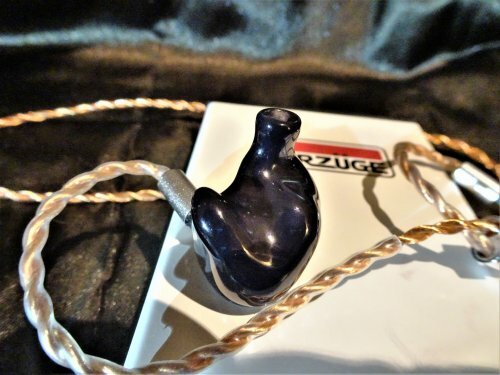 It becomes quite evident very quickly with these IEMS they are going to be just as easy to listen to as they are with the very efficient 20ohms it takes to drive these 10 driver IEMS. The LSX sound is one of gliding smooth velvet with rich deep resolving bass lines, non-offending extending highs and a minefield of details in the mids to die for with good level of tonality across the board. The Larks never sound like they are struggling to deliver the music to you, it has an uncanny knack of making it all seem free flowing organic analogue feel to the sound the LSX offers which makes these IEMS quite easy to find good synergy with other equipment regardless of their signature which in turn also makes these a better IEM for all those poor recordings out there that are over harsh due to the LSX signature. Although a poor recording will still be obvious to hear the LSX has a forgiving nature with the smoothness and finesse in the manner the treble handled by Larks tuning makes any harsh or hard recording sound more bearable than normal but it still won’t hide the shortcomings of a poorly mastered recording in general. Some treble tuning even on a flagship IEM can sometimes be almost trying too hard in been over resolving and become detached from the rest of the music like a separate entity that distracts your mind and becomes an irritation taking away concentration on the overall balance of anything that may be happening with the all essential mids or even bass areas. The lower and mid treble notes on the LSX manage to knit into the mid-range part of the music with good cohesion which doesn’t give that detached feeling when listening to the treble range. 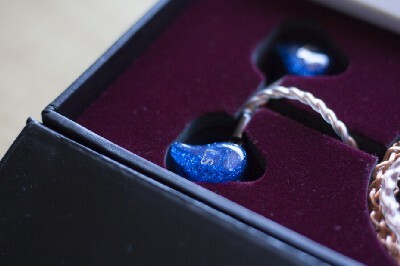 Some might say it is a rolled off or rounded off to be a non-offending treble but this IEM treble still has that airiness and smoothness whilst having that shimmer and lively energy with trailing edges to symbols and hi- hats in the extension decaying well when the treble note arises above the rest of the frequencies in the mix. This allows the treble to never be lost in the mids and the super tweeter allows the treble extension to rise above everything to the higher frequencies when the recording requires it giving that top end giving it that more feel of openness and a natural ability for the highest notes to become more prominent to hear in delivery and decay more precisely yet does this without ever wanting to sound like someone putting their nails down the blackboard due to the silky liquid smoothness of the treble tuning. Instead the gently smooth sweet sounding treble notes blend in with the mids and bass on an even kilter making listening sessions a pleasant experience with still been able to enjoy the intensity of those higher frequencies when they happen yet because the LSX has room for instruments to breath you just naturally hear those treble notes shine through the overall mix of the mids instead of you having to concentrate on finding those notes making it more naturally relaxing sounding and not that tuned type of flagship IEM that is trying to scream look at me I am your analytical high detailed thinned out treble that wants to use razor blades in your ears to make it’s point. The Lark's mids are definitely the engine house of these LSX with its four drivers syncing very well with a vast amount of detail with a full bodied rich dynamic versatile mids which you would think is a given for a flagship IEM that has four drivers delivering the core information yet it does it with a flexibility and subtlety and clarity you hear the fine timbres of instruments are projected with clarity and deft vibrancy and energy to each note attack. Coupled with a good noise floor on the LSX which these very efficient IEMs never showed any hiss with the equipment I tried it with is what helps it give it still enough room to breathe in the space it has to work in and keep good clarity with a soundstage that is maybe not the largest I have heard on an IEM but it is still competent enough at this level as I think due to the LSX getting the balance so right in many other areas this never becomes a factor unless of course you are a diehard Sennheiser HD800 fan who craves that dizzying vast soundstage to show of the imaging in an IEM also. 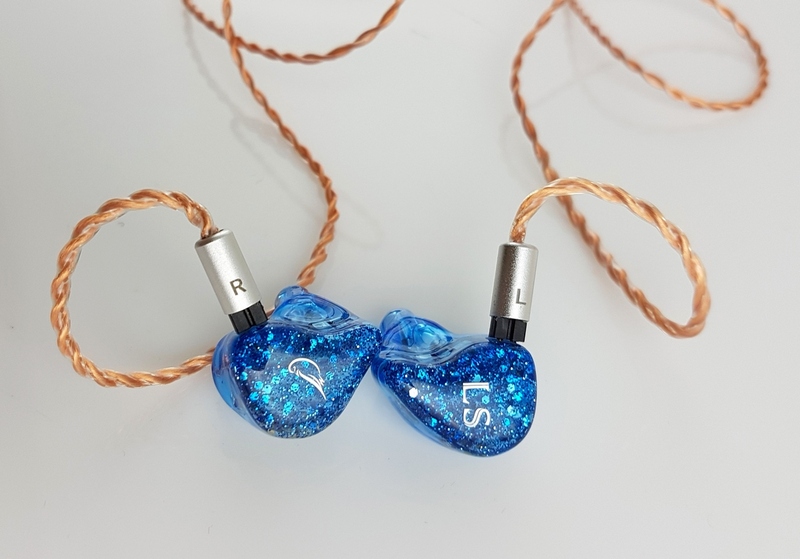 The LSX’s characteristic is actually a fairly intimate closer feeling sound which makes you feel very close to the band performing so much so it feels like at times you are in there with them pretty much instead of the performance in front of you. Some may prefer it as if you was sitting further back in an auditorium feel or the soundstage was huge but I personally love this type of delivery in the mid-section and although it is an intimate feel the LSX still somehow manages to feel spacious enough to have room around the notes to breath due to the way the depth and headroom Is dialled in on the LSX. The Lark IEMS even though as mentioned above with the close intimate sound has a very accomplished imaging which is accurately pin point and fast which was one of the straits of this IEM that impressed me a lot which also helps with this IEM feel like they still have a good sense of air between each note due to the accuracy in timing with the imaging. Timbre is one of the corner stones that makes this IEM shine with the ability to do subtle micro detail with trailing edges on Violins or acoustic guitars you could hear those small changes in the string vibrations of the note decaying with ease due to both that closeness to the music I mentioned earlier. The perfect timing with the start- stopping of notes making string frets really resonate with the note changes with any type of guitar on the LSX with help of the super tweeter kick in with its liquidity on the higher string notes which making these LSX so non fatiguing to listen to. Vocals have good tonality, clarity and placement in the soundstage with the low floor noise the vocals stand out without ever been overbearing or shouty. I would normally point out which vocals in particular an IEM shines with and doesn’t yet any vocalist sounds full bodied and powerful without spiking or booming whilst been able to showcase the versatility of been supple finer details with delicate vocals to the aggressive upper mid-range & treble edge of grainy rock vocals styles just adds to the fluidity of the mid-range naturalness in tonality coming through. Like the overall soundstage vocals feels fairly intimate and I must admit I am one who prefers the feeling like I am front row with Tori Amos, Stevie Nicks, Gregory Porter, Adrea Bocelli…list goes on, yet given the cosiness with vocals on the Lark’s they always seem to have plenty of separation and headroom to work in and breath on their own in the mids as these IEMs just make you want to listen for another hour at a time with the LSX portraying the accurate vocal qualities tonally makes them very rewarding in this section. Drums had the same ability as strings do with tonality to trans-fixate on the LSX with the rendering of each bass note impact been played as what it manages to pull off in the mid bass section here is how well the low mids are seamlessly in sync with the upper and sub bass section that there is no disconnect allowing for a more natural decay of instruments so with drums there is no hump or in the lower or higher mid bass frequencies here which I have known to ruin a good overall IEM that I owned in the past. Considering the lush, smooth and warmer side of the LSX the piano also manages not to be coloured at all in tonality allowing most genres of music to stand out when a real piano is used with the good air and sparkle towards the top end of the key notes with flat notes having good resonance with subtle harmonic decay of strings depicting whether a key is been stroked softly comes through clearly or if a key is hit hard delivers good impact to the mid bass. Sharp notes loudness rise to great effect in the upper mids helping tracks like fast blues piano playing come to life with good zest and dynamics. Because of the impeccable timing and depth that the Larks possess it makes hearing the resonance and vibration in notes have feel as well as sound even on BA drivers it all adds to piano sounds having a soul on the LSX and not just a hard sounding dull note played each time. 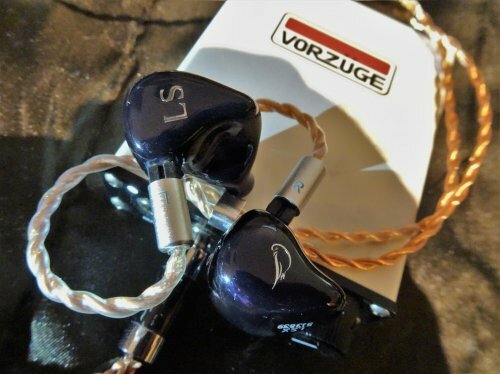 The LSX is far from not trying to be the most analytical Flagship IEM on the planet and does not try anything other than a midrange that has a good focus on a smooth liquid detailed harmonics with mid bass notes allows for a natural layering of continuous decay of the note through to the lower bass floor. Even though this IEM has a moderate staggered V shape the mids work flawlessly with the sub bass region does help a lot towards making this IEM have that feel of having a consistent balance in the bass response but also over-all balance to spectrum when you are listening to them as even though the LSX is not tuned flat/ neutral it has just the right balance of tonality, timbre and timing to make these sound organic analogue heaven to listen to with most genres I tried (Classical, Rock ,Dance, Pop, Metal, Jazz, Blues, acoustic, live recordings) making this quite a flexible sounding IEM. 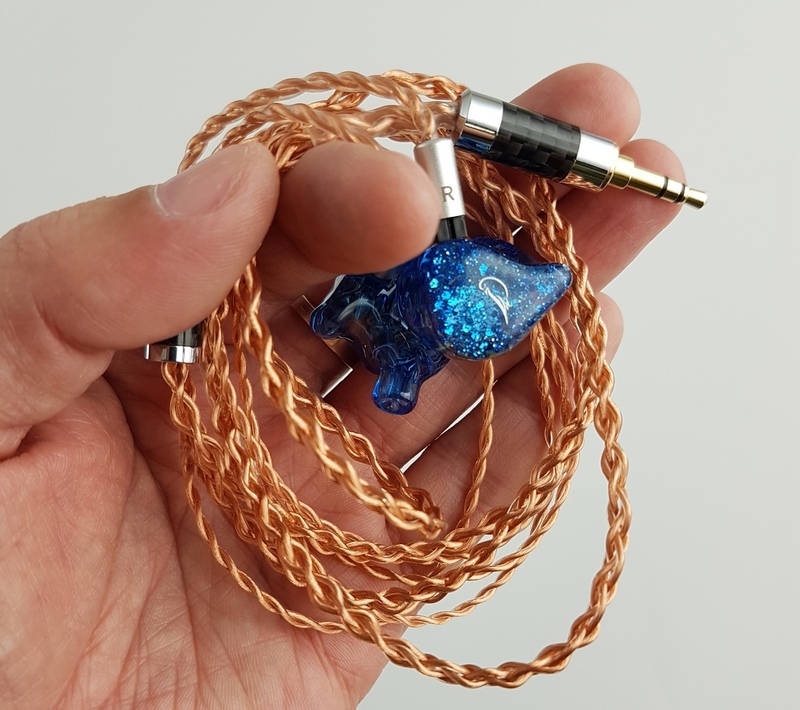 It’s hard for me not to say the mids really are the jewel in the crown that shines on these Larks, not that this makes them any more dominant in any way to the lows or high area qualities this IEM possesses, just the mids are very accomplished because they are so harmonious with the lows and highs is what gives the LSX such a natural balanced feel to the signature when listening to them. Bass will always be a decisive factor in choosing an IEM just in terms of the quantity of bass we each personally prefer from a light weight sub bass or a heavy sub bass on the bottom end and there will always be those that want a more studio monitor neutral flat response or those who want Rob D’s Clubbed to Death bass hit you as hard as been surrounded by 400 watt speakers in a night club. Yet with the three drivers on bass duties the LSX provides a smooth bass transition through the range with a good tight powerfully weighted kick in the lower mid bass which decays well through the lower frequency range with good control and depth without ever losing control. The LSX may not be the tightest ever bass around out there but it has enough grip and control that a bass hit never sounding bloated or soft with any songs I heard. The LSX is on the right side of a rich deep dynamic bass without been over rich which I think hits the right balance of having enough bass which would reflect how low you would realistically hear a drum kick go in a live environment for example without been over accentuated falsely. This falls between both true bass heads or neutral flat bass response perfectionists and those who like a bit of added bass that won’t over running & ruining rest of the sound spectrum. The devil is in the detail as well as the quantity of the bass and from the mids to the lows in a bass note is helped by the clear transients which help differentiate the types of bass notes been played. The lowest bass notes attack and impact it gives feels upfront with the rest of the music yet the reverb and decay of the bass note falling away into that black background can still be visceral in feel below 60hz which is always welcome in a BA driver layering it more behind upper bass note impacts giving the bass a healthy field of depth from the mid to low bass region which is great for rock, blues or jazz music especially. Somehow it seems Lark Studios have paid as much attention as everything else on this IEM to getting just the right balance for it to blend in to the mix without been overbearing into the mids and stops before becoming too heavy or over bloated with songs. In all a very good high quality tuned bass that suits any genre well due to its well-controlled tuning and smooth consistent manner that can still have good impact in the right places to give it slam when needed yet maintain subtleness when needed with the detail rendering through the fine timbre showcased on these Lark IEM’s. With the Sony WM1A Walkman the LSX soundstage was made to feel more spatial whilst the Sony’s now more balanced airy detailed mids since a major update last year really shows off the Lark’s resolving mid-range ability with clarity and the now more linear tighter bass on the Sony gives a synergy that makes them an ideal pairing with the LSX’s. It was a similar story with the Onkyo DP-S1 just the SX1 sounded a bit more neutral and brighter in the upper mids with a more attacking emphasis on the mid bass to the Sony whilst still sounding balanced as the DP-S1 more direct lively approach mirrored the warmer smooth nature of the Lark’s signature to great effect. Vocals really stood out with an air and height to a singers range like it had no ceiling felt like vocals on the LSX was the focused driving force that carried the Onkyo to have a good transparency and tempo. A third different sounding dap in the newer A&K AR15 A&Norma which feels like it has gone back to the more old school smoother A&K sound compared to its predecessor the more funky sounding dynamic A&K 70 mrkii yet the LSX is still at home enough with the AR15 with the clarity of the mids on both the AR15 & Larks been able to capture the subtle details and reveals a good openness with the top end having a noticeable sparkle yet a certain amount of the natural smoothness the A&K provides without both been over bearing in warmth or richness. I found with all three daps I tried the LSX they all paired well despite all been different sounding daps albeit they seem to step up in warmth with the Onkyo been more dynamic/ bright, the Sony been richer with still a moderate amount of warmth since the f/w update in 2018 and the A&K has warmth with smoothness. If it was the Sony before it had the major fw update taking it from super warm and rich with it's boomier sub bass I highly wonder if it would have been too much together with the LSX’s but with the new fw update been more refined, linear and airy than previously with this and the Onkyo’s sig make for an equally as good yet different pairing with the LSX and the AR15 although sounding enjoyable enough they were just missing the bit of life & dynamics missing with the Sony & Onkyo players brought to the LSX with the right balance to counteract the smooth richness the Lark’s have to bring the best of both worlds together. Moving on from daps running the LSX through a Pioneer U-05 Dac headphone amp and a Sennheiser HDVD800 Dac headphone amp showed even though the Larks are a very efficient IEM they scaled up really well with a nice big desktop amp and again like the daps it was very adaptable to both the opposite scales of sound signatures the Pioneer and Senn amp/ dacs operated at. The LSX loves the extra currents on tap of these desktop amps yet managed to still sound quite on the noise floor on both amps which just helped the LSX feel like it had more depth & headroom to play with than it did on the daps which was nothing to complain about to start with but again was noticeable if for example I added the very underrated high quality Vorzuge Pure portable amp to the daps via line out just goes to show what extra you can still get out of these tiny micro drivers with good high quality amping. The only down side I could find from a signature source with the LSX if the source bass was a bit softer or warmer with the likes of the Senn amp or a Chord Mojo the LSX would still enjoyable enough to listen with but was evidently noticeable when I then paired with a more tighter linear controlled source like the Pioneer U-05 or Vorzuge Pure amps that add that extra tightness controlled attack and neutrality with more headroom and airiness or brightness that counteracts the Larks more lush approach have that same effect the Onkyo or Sony daps did paired with the LSX. 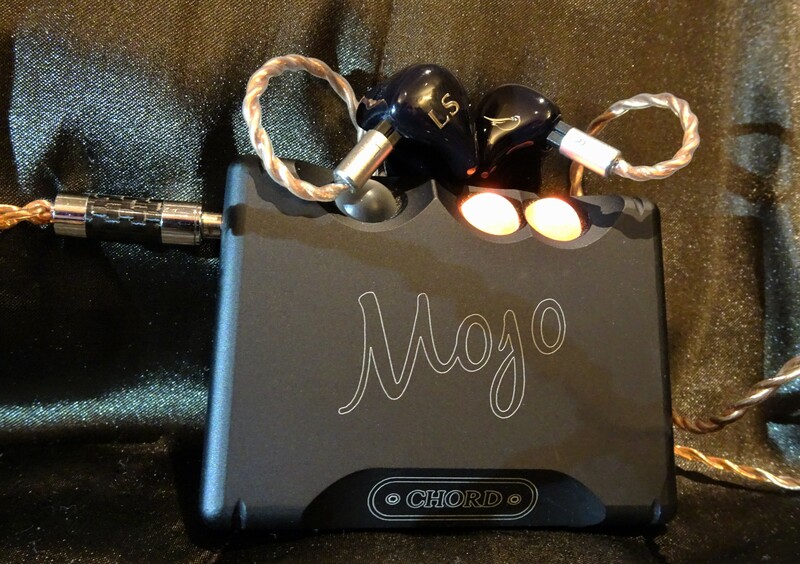 The Chord Mojo pair’s fine with the LSX but the warmth of and the lushness of bot the Mojo & LSX might be a bit too much for some looking to strike that balance of the LSX smooth lush side but not overdo it. But if I was to pair the Vorzuge Pure with the Mojo the story changes on the cleaner signal and power tightens it all up with added weight and extension giving a less softer fuzzy lush approach to the LSX’s so they shine at just the right balance without sounding too soft and dark. With the Pioneer U-05 coming from the same stable it is very much same type of signature to the Onkyo DP-S1 DAP but with a bigger better amplifier and running with a XLR balanced really gave the LSX a more expansive projection with and headroom scaled it up another level on the smile-o-meter with the LSX. The last piece of equipment I had to try the Larks with was the Mojos older and now newer brother in the Hugo2 which before plugging It in I knew how much improved the H2 is to the original Hugo making it more versatile, further controlled and nimble than ever with anything that now gets hooked up with it due to its vastly improved voltage section, yet until you hear it you still do not know how these things will inevitably might pair up. Despite knowing how good both the H2 and the Lark’s are it was a bit like hitting the jackpot as the analogue wizardry of the Hugo 2 analogue sounding dac and balance between aggressive and passive aggressive it can walk draws out the full tonality, dynamics, depth and detail these Larks have to offer and combines the power of the amp to deliver plenty of body and resolution to every note played (especially noticed with vocals here) yet somehow find even more calm and space for the music to be delivered to the LSX drivers made it an all-round performer to the highest standards with Hugo2 driving the LSX. On the cable front the only thing left for me to try which would of been nice to compare which was unfortunately not available was the PW audio Saladin cable that Lark offer as an upgrade cable to see how much better the LSX could sound as the supplied universal cable only had a 3.5se plug thus not been able to try it in balanced mode in theory. Alas I have a pure Silver custom made cable (to my spec) by a good fellow head-fier LEDZEP who only uses good quality silver solder on the connections and makes it to military spec literally and can hot swap balanced connections using mini XLR connectors. Up to now I had enjoyed the LSX with the supplied copper cable enough but the Silver cable takes it to another level of clarity and control of notes whilst also adding a slightly more neutrality to the signature just enough without taking away what is already the magic of the smooth, liquid detailed LSX sound. I was then able to find out the also added benefits of running this now either balanced 2.5, 4.4 or XLR 4 pin so the LSX running in balanced, especially with the XLR balanced finds that extra bit of space and airiness in the soundstage whilst giving more controlled higher headroom with a desktop rig. I have found some warmer sigs like the Larks in the past benefit staying with a copper cable ( i.e. 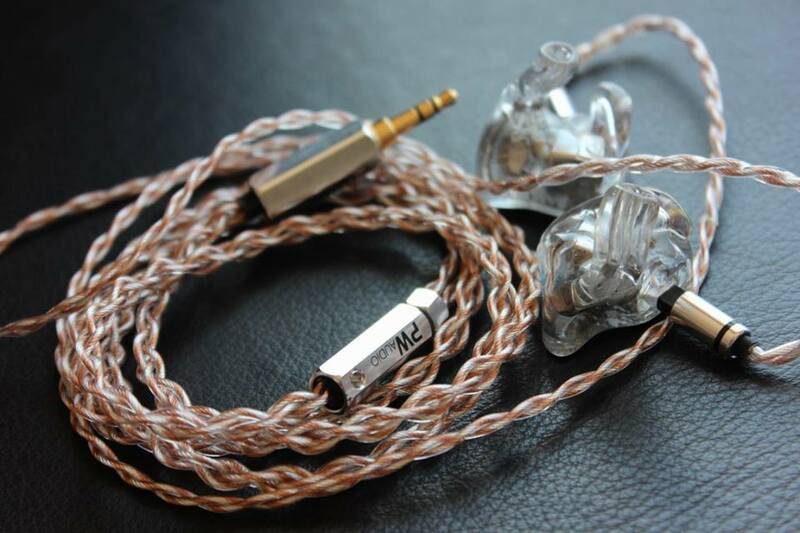 Meze 99 classics for example) more than a silver just for the natural pairing for the timbre side of things but putting a pure silver cable on (even running in SE mode) gave it a further improved performance whilst still maintaining what makes the LSX foundations to its signature sound so great. I’m not sure where to start really as from the word go these were easy to get on with and the natural fluidity and striking the right balance of warm with detail yet keep it still quite airy with space and clarity to breath enough whilst been dynamic delivering a natural timbre & tonal quality all round has made it hard to pick any holes in this IEM for those who appreciate dynamic, rich and smooth force of nature enjoying music which still is resolving due to the high amount of varying levels of detail which I have to say won me over quite quickly with me saying to the LSX’s at the end of my time with them “You had me at hello”! Only negatives if anything on the sound would be for those ears out there that prefer your signature to be a neutral flat response only or a brighter treble sound or further still like it tuned above the 3db in the sub bass department or you prefer your IEM to have that vast big soundstage then I would say these might not be for you possibly but as one who appreciates and loves the In Ear Prophile 8’s as one of beter neutral IEMs I have heard or owning the bass hungry darker sounding JH16Pros I would say give them a try and they might surprise you how they pull you into the music with minimal effort. 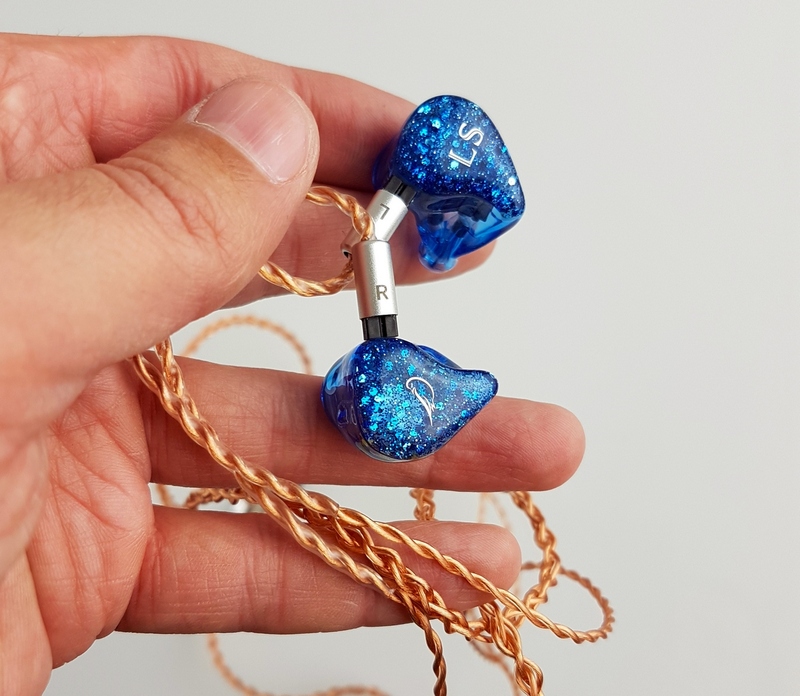 That’s of course if you do not already own maybe a IEM like the gorgeous higher resolution JH Layla’s or Obravo master pieces with mind blowing natural visceral bass I have ever heard from a IEM which comes to mind, both of which are in the £2.5k + £3K + bracket to note. The Lark LSX to me is simply a beautiful mid centric full sounding tonally organic IEM that strike a good all round balance that when paired with a livelier or brighter or less mirrored image of the LSX gets the best synergy and balance for these IEMS. 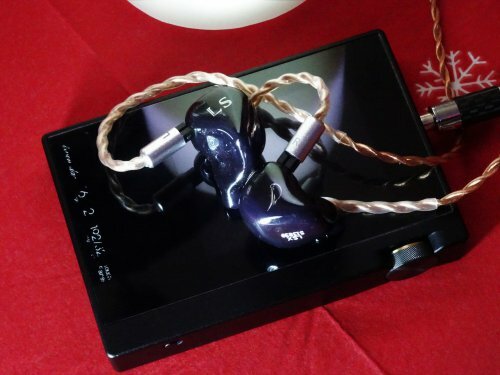 I even thought about the price which tugged at me a bit as the price to have customs is no more than the universal which then that initially sounds great from Lark considering they also charge no extra for artwork on either universal or CIEM plates that other CIEM manufacturers do but maybe the universal price could still be a bit lower to start with which I was thinking the latter and still do really as I think maybe $200 lower than the customs would be about right. After ten glorious days with them and listening to plenty of other flagships out there ranging from £1K to £3K in the last year I would have to say I would actually still pay $1699 for the Universal as all I know is if I had the money at the moment I would of ordered a pair from Lark Studios by now which was only clarified for me by myself when I sent them back and consequently missed them greatly within the first day of not having them to hand. Only other gripe personally as I am a bit of an overall package/ design & purpose for storage pouch, good as the LSX is on Sonic’s alone and the accessories supplied and packaging is solid enough I feel when you are getting a flagship IEM as both a customer and for the companies sakes from their POV they need a sharper eye in the design department to make them stand out a bit more from the crowd with a more modern and sophisticated presentation. The travel pouch or case needs to be more protective with purpose as also the overall packaging and brand design to reflect their high quality product in this very busy and competitive arena in the IEM business so hope it is maybe something that naturally will evolve and improve over time with the company growing with future success as they release more models. Despite still not been completely perfect I found it hard to fault the overall sound partly as this happens to be my type of signature anyway so tried to do this without there been any signature bias, if anything I was probably harder on it as I know how I like this type of signature to sound from having my Vibro Lab Mayas at the moment (which after this I have to concede this is definitely another level up to the Mayas in most areas for the record!) but more importantly the LSX regardless of its signature managed to nail every one of the many departments like timing and harmonics in making music sound balanced, dynamic, clear and detailed in a enjoyable manner making the LSX fluidly cohesive and natural to listen to for hours at a time. I know it feels like Lark is new on the scene to some including myself and is this maybe a case of flavour of the month some might ask as some IEMs can have a touch of that sometimes but all I know if you like what you hear from the LSX with their non-fatiguing sound these will last many moons more than just the latest flavour that passes into insignificant to the next big thing next month. 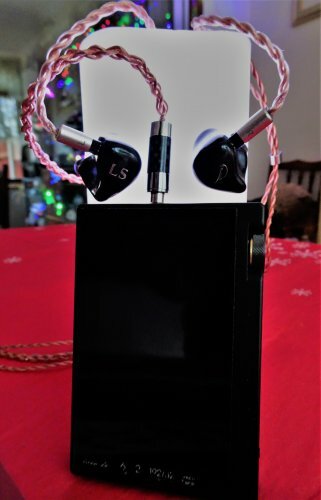 For me the LSX has the long term addiction to portraying music with detail with soul & emotion combined with deft and uncanny tonal performance could make this a cult legend over time sound wise alone as much as the Noble Kaiser 10 or another great 10 driver IEM by the same great man back in the day which have similar signatures. To finally sign off I personally would give overall a 4.5 only for the fact I think the presentation/ design & quality with case & pouch could be better for the price as well as the universal price could still be a bit lower but for sound alone these Larks would get a 5 rating only for the fact I could not find much to fault when listening to them despite not been the widest soundstage or the tightest tuned bass out there (still above average though on bass) and that they pair easily with different sounding sources as I simply just could not get enough of listening to them in the ten days I had them. I hope that going by this Lark Studios go from strength to strength going by this first outing from them so will be interesting to see if they can produce other models regardless of costing less or more than the LSX that they keep to the bar they have set for their house sound and principles in the LSX and produce good balanced liquid detailed IEMS that one can just enjoy the soul of the music rather than analyse with a microscope of concentration. The IEMs were audiotioned at home and were received part of a tour. Many thanks to the organizers for the opportunity to listen to and enjoy these IEMs. In terms of look and feel, the LSX seem very well built and the size is certainly smaller than both my Layla v1 and ProPhile 8 that I will be comparing these with. 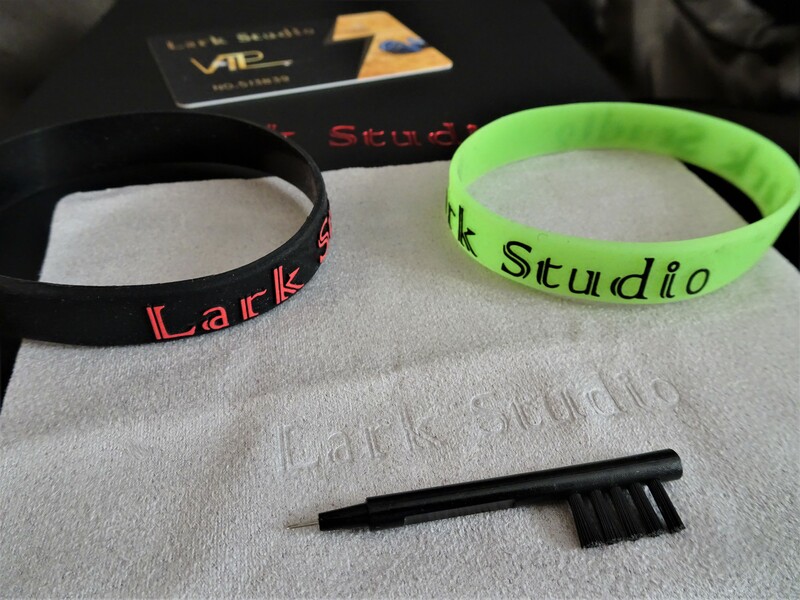 The Lark Studios won't protude much while inserted in the ear. The stock box is very well presented and they come with a great looking copper cable with standard 2 pin connectors. I have to note with this cable the socket fit is not particularly tight. 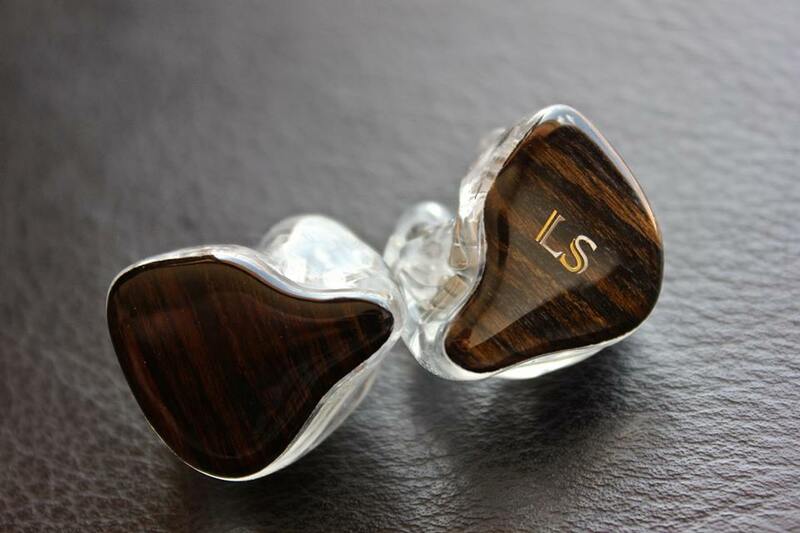 The LSX sound bores are the largest out of the 3 IEMs. Onto the sound impressions. From the first seconds of listening it is obvious the LSX have a very particular tuning compared than the other 2 IEMs I use regularly. 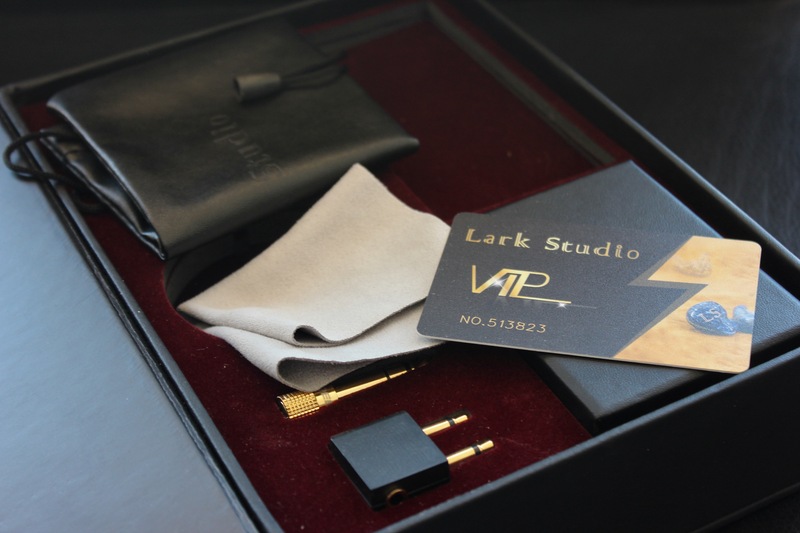 My first impression of Lark Studios was that of a warm, lush, dense, smooth sounding IEM with enhanced bass response. Switching from the Prophile 8 the Lark Studios sound a bit neboulous and dark, more closed-in, but with great depth, liquidity and good impact. 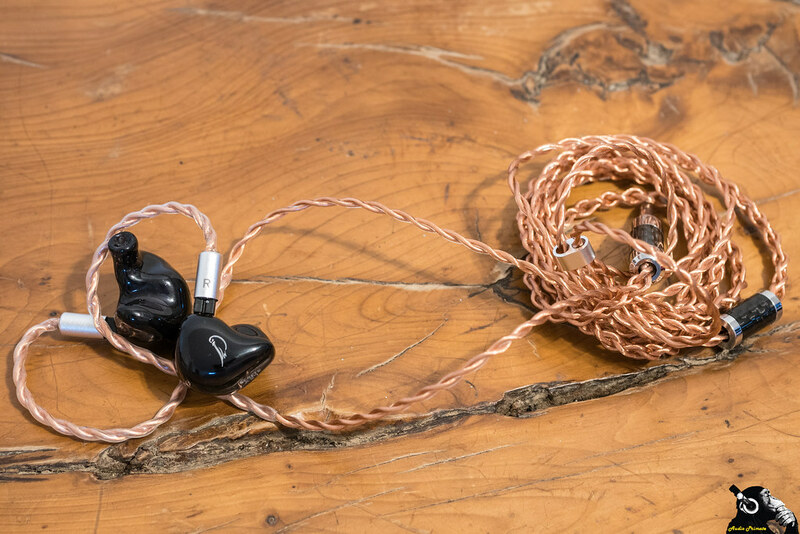 In turn switching the other way, the Prophile 8 sound more crisp, snappier and dry, with great clarity and instrument separation. After a few minutes of listening the first impressions mitigate on both as one gets acustomed with the sound. Two very contrasting sound signatures. The LSX bass quantity is boosted compared to PP8 and Layla (both in neutral position on their controls as they have adjustable bass reponse), with strong midbass presence. The LSX bass quality is good, but not amongst the best. It is obvious compared to both PP8 but even more so Layla, that bass resolution and focus are significantly more defined on the latter. This is in my opinion the biggest weakness these IEMs have, but at least the bass for most part doesn't overshadow the midrange, which is good. Envelopping, warm, well textured. Pretty awesome with female vocals for example. 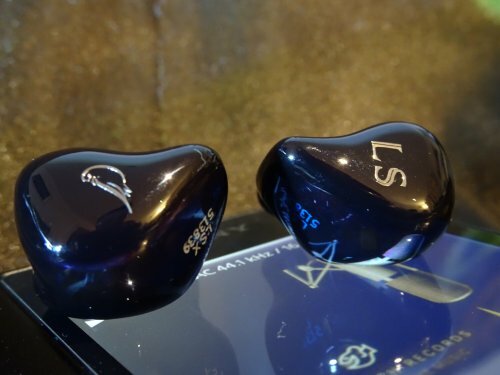 The LSX have significantly increased density and thickness compared to both PP8 and Layla. The Layla are the most analytical sounding in the treble region out of the 3. Amazingly detailed (for any HP not just IEMs), lots of air, crisp articulation. PP8 are in between, slightly smoother treble, less detailed oriented but still have good bite and air to the treble. The LSX in comparison have the smoothest and most laidback treble response. Treble heads might look for something else, but everyone else will find the treble pleasing and accomodating to most recordings. With the LSX vocal sibilance is kept to a minimum, but not entirely obscured where present on the recording (I used some badly mastered test recordings to assess this), which is good meaning they are accurate enough. In terms of overall stage size: Layla >> PP8 > LSX. The LSX have the most compact stage, but with great depth. It doesn't feel closed like some lesser IEMs I had in the past. Despite the thicker/warmer sound the LSX can hit quite hard. They are still armatures after all. Not a huge difference here in terms of impact, but I would say the Layla have the edge over the other two. Based on previous descriptions it should come as no surprise the LSX have the most liquid decays. Detail: Despite their warm/liquid character, the LSX are actually quite well resolving, except for the bass which I've already commented on. 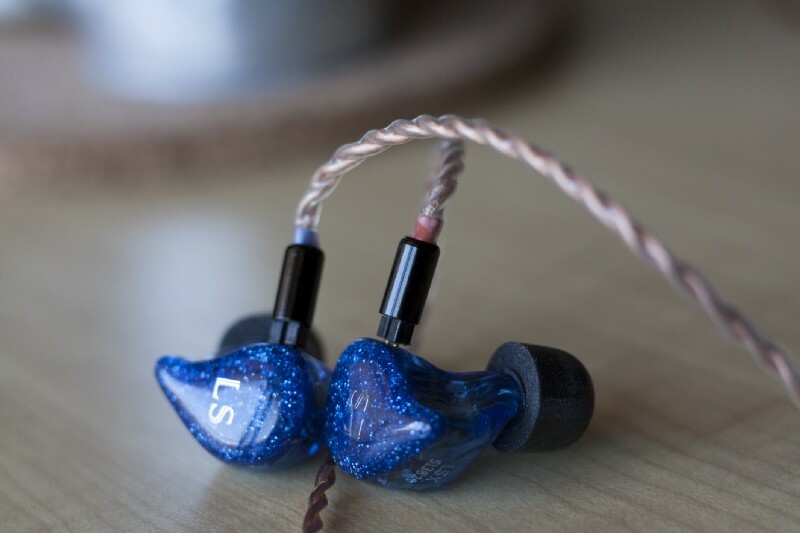 In terms of detail extraction the Layla are easily the most revealing IEMs out of the three. 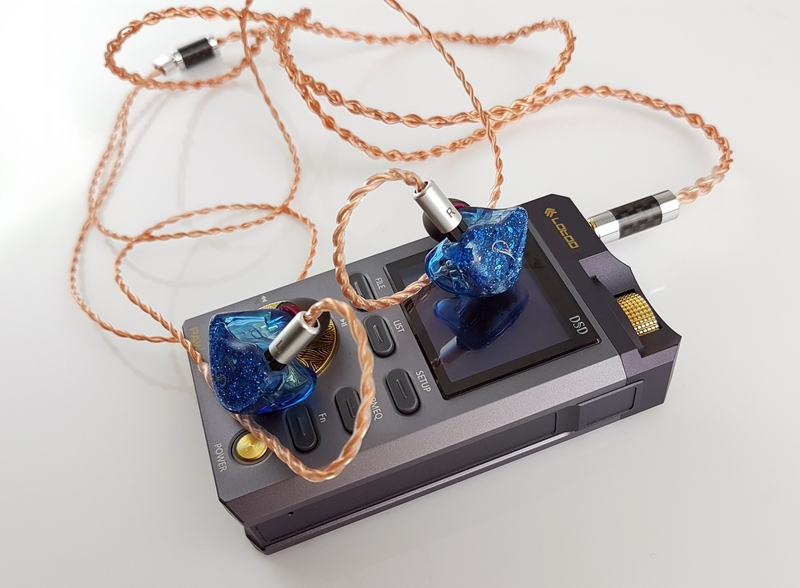 In fact they are so resolving, that with below average quality recordings one could wish they hold back a little bit (a bit like HD800 on IEMs). The PP8 are next in resolution, a couple of notches below the Layla, which makes them quite a bit more forgiving. The LSX as a combination of their warm/smoother balance are the most forgiving out of the three. I would in fact personally pair the LSX with a very assertive DAP/rig. 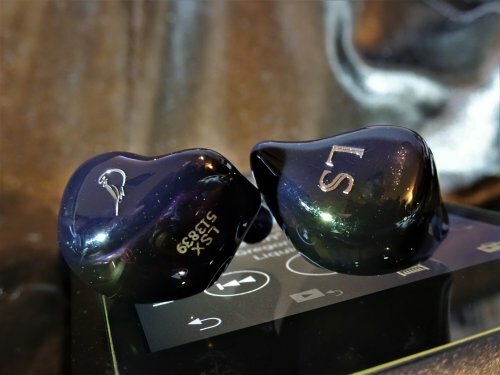 Against these top level performers, the LSX may come last with regards to their technical abilities, but they have a very seductive and engaging sound, only slightly let down by the bass quality (also quantity imo, but I know some prefer enhanced bass response). I have been really enjoying my time with them, and while I do not view them as all arounders, with modern genres they are quite fun IEMs. Pros - Comfortable & quality sound, ergonomics, appearance, product quality. Recently, the skylark fluttered to my window sill and at once charmed me with its flurry chirping. We quickly became friends, and I learned that my guest had flown in from distant lands specifically to amaze the true connoisseurs of bird trills with his singing. But I will not fool you anymore and pretend to be an ornithologist, my lark - these are wonderful 10-driver IEM from the young Chinese brand Lark Studio. And this bird, I must say, has an impressive coloratura. Hurry to hear! Packaging-book of thick black cardboard resembles an old volume in a good binding. From above on the center the name of the brand “Lark Studio” is displayed in red stamping. Components from the category of "all inclusive": the IEM themselves with a removable cable, tips: four pairs of silicone (SpinFit), two pairs of foam (Comply), leather case, microfiber cloth, adapter for listening to the plane, adapter 3.5 / 6, 3 mm brush for the care of sound tubes, two rubber rings / couplers and a plastic warranty VIP card of a client Lark Sudio. 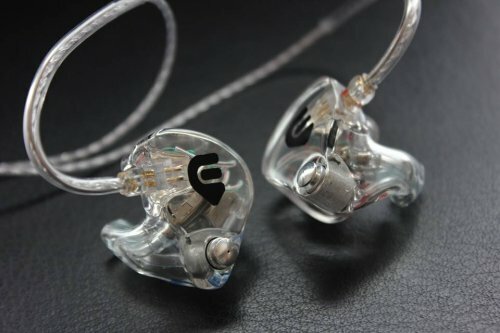 By the way, earphones can be ordered both in a universal and custom (CIEM - made on the cast of your ear). In this case, you get another branded PELI CASE. As a matter of fact, this universal version, is a sample of custom headphones. 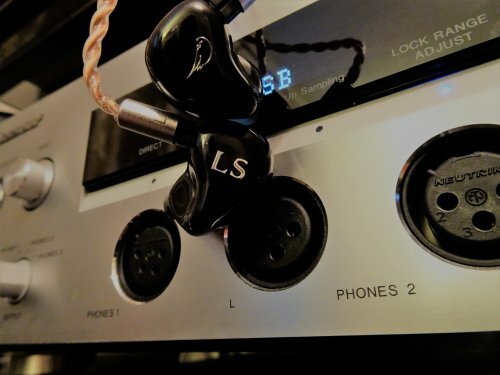 LSX stands for: L – Lark / S – Studio / X – 10 (BA). The acrylic shell is wonderful. It is small and very convenient. Shell - transparent, sky-blue color, through which you can see BA drivers and crossover. On the blue-blue faceplate, they crumbled and froze, like stars, iridescent sparkles. On the left earpiece the "LS" logo is displayed in silver, the graceful profile of the lark is on the right. Everything is elegant and artistic. 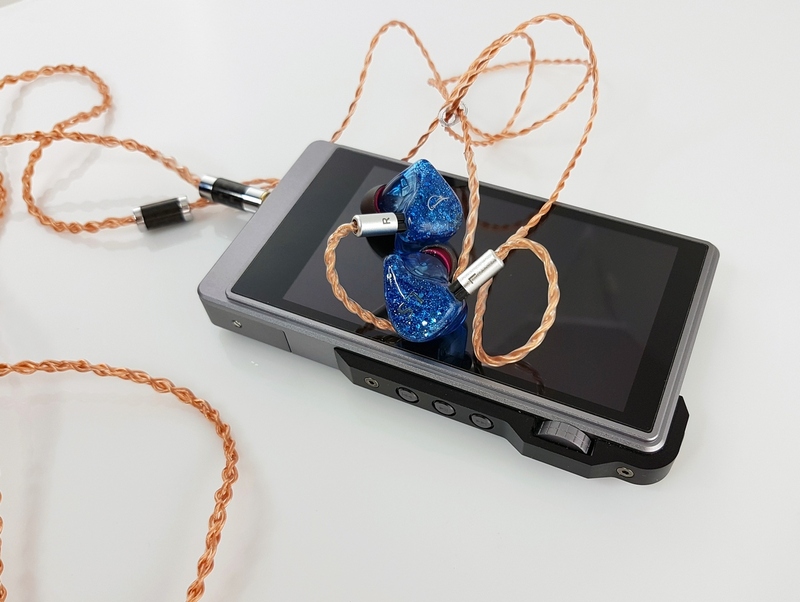 Inside each IEM fit ten BA receivers / drivers: 3 are responsible for low frequencies, 4 - for medium, 2 - for high frequencies and 1 tweeter "Super High". There was also a place and passive 4-way crossover. And on the tip of the sound pipe, in a small recess, there are two holes, to which acoustic tubes are connected. 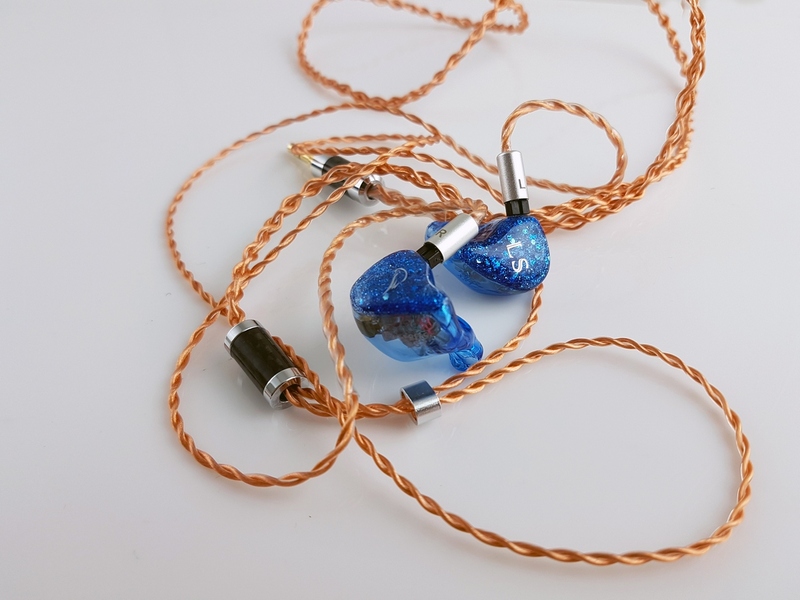 The cable is of high quality, four-core, made by braiding with a pigtail, not the most elastic, but cute: TRS 3.5mm plug is straight with gold, connectors are 2pin. When ordering, you can choose a cable from the brand PWA. Well, now it's time to listen to music! 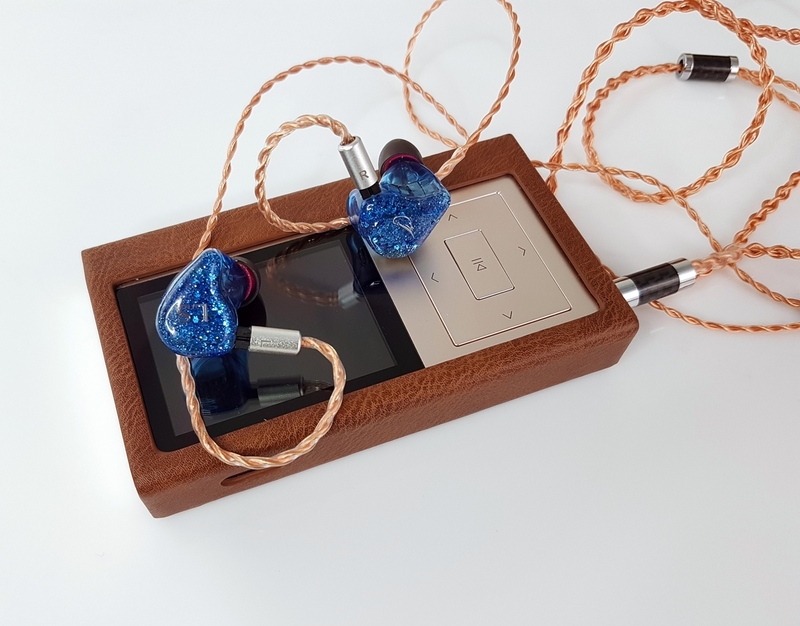 Listening was carried out on: MyST DAC 1866OCU V.2, QLS DA 9.1 Melokin, Lotoo paw Gold, iBasso DX200 (AMP7), iFI xDSD, iFI micro iDSD Black Lable, & QLS QA-361. 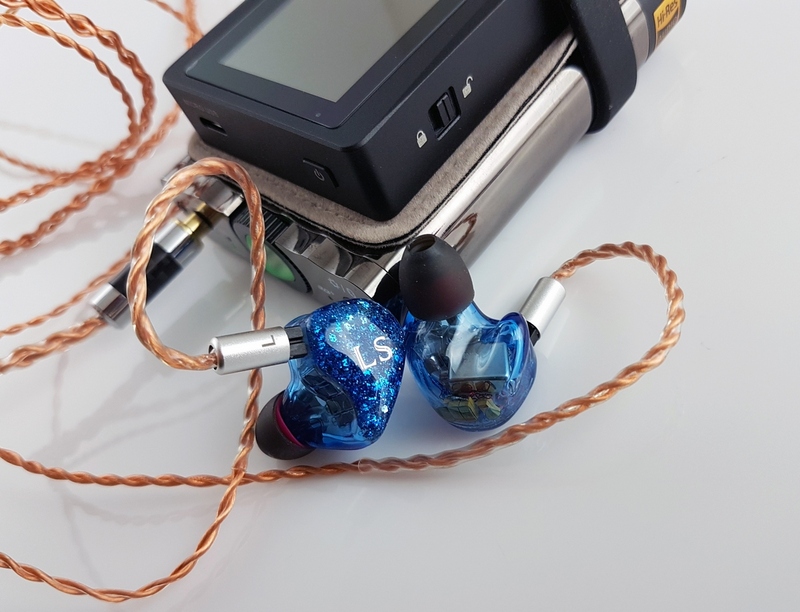 With all devices IEM were won back wonderfully well, the handwriting changed slightly depending on the source, giving the LSX its own unique hue. It is worth noting that after 20-30 hours of use, the sound of the earphones has changed for the better, adopting a smoother, darkened and enveloping manner of presentation. The changes are not cardinal, but, nevertheless, they have the most beneficial effect on the final formation of the LSX palette. The LSX demonstrate clear, powerful, dense, dynamic and extremely beautiful sound with a scrupulous display of all the small nuances and dark background. This is not the sound of studio monitors, it is a cinematic, captivating manner produced by a high-end home audio system. The resulting picture is similar to the image provided by a large 4K high-definition TV and luxurious color reproduction. Sound images are saturated, accurate and contrasted. The musical landscape is drawn with the finest strokes, which are woven into the general rhythm of color and tone. They harmoniously line up, forming a colorful and elegant holographic composition. This is a modern, expressive and extremely musical manner of presentation. The sound of the Lark Studio LSX can be described as “juicy”, detailed, comfortable and melodic. It is layer by layer saturated with color, sustained in warm colors. And all this is complemented by a powerful bass making a dark rich background, and a light, unobtrusive spark. The result is chic, bohemian manners and amazing musicality. The low-frequency range is neatly forced, the bass is powerful, precise and well textured. The mid-range is smooth, clean, extremely melodious and informative. The high-frequency range is neatly accented, served comfortably, without sharp bursts. This is a picturesque spark, which, like fireworks, effectively shimmers, illuminating the night sky. This is a warm, detailed, pure, emotional sound with an unheard of musicality. And although the LSX still have a V-shaped frequency response, where the mids remain in place, gently accentuating the mid-to-high interface, and the edges of the frequency range are forcefully forced, the sound is surprisingly well balanced. These well-placed accents give the LSX sound the very “juiciness”, beauty and emotionality. Loose guitar jerky scatter chords between beats, inclining to idleness and fun. Tight and relief bass defilely between the point punches of a drummer. The resulting clear rhythmic construct orders the listener: "Stand up and dance!". I swear there's nothing wrong. The sound is smooth, expressive and melodic. LSX, expressively chasing every beat, melodiously convey the emotional component of the composition. So I want to go out, find a carefree company and hang out till dawn! Or you can switch to Tina Turner "Private Dancer". And now you are already riding in a posh limousine and with interest you are looking at the shop windows and neon lights glittering with the signs of a big charming city. A drizzling rain drizzles from above, drops drip slowly down the windows of the car, leaving elegant wet strokes behind them, and behind them velvet heady notes roll down into their ears. LSX is foremost and atmospheric in the sensual core of this song, and Tina’s stunning voice beckons along like a rat-catcher from Hamelin. LSX virtual space is drawn quite spacious, proportionate to the width and depth, creating a contrast multi-dimensional image. Low frequencies dominate the rest of the band a bit, affecting hearing with a powerful, precise and rolling blow. The bass is embossed, fast, gives the overall sound depth and massiveness. The mids is smooth, elegant and informative. It is served in detail, purely and emotionally, caressing the ear, rather than annoying it. String and vocals sound clearly and appetizing. The upper middle is gently pushed forward, which gives the vocal parts a bit of expression and elegance. The pleasure of listening to get extraordinary. This high-quality and comfortable sounding which can enjoy hours. 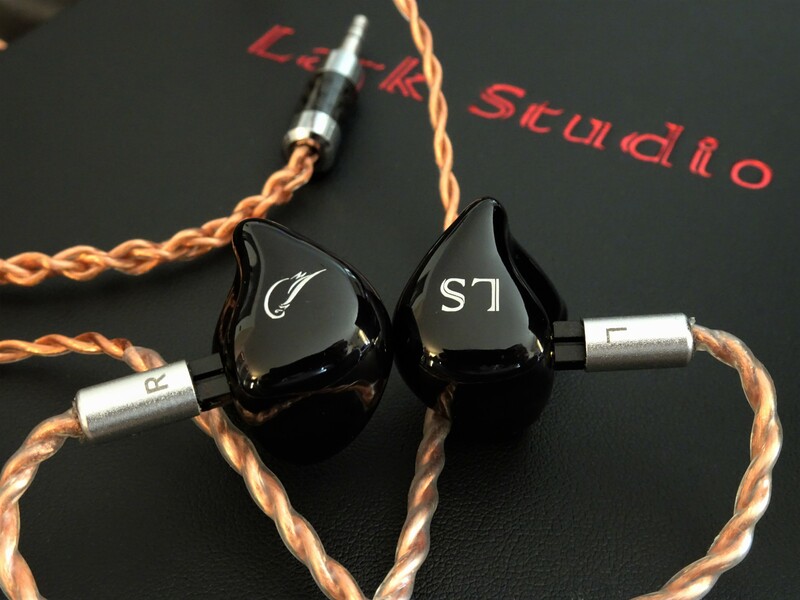 Lark Studio LSX are great IEM that can satisfy the most demanding music lovers and audiophiles. This is a true delight with immersion into the atmosphere of a beautiful and extremely musical sound. What the LSX lacks a bit is the refinement, refined manners and improvisation. This is a good professional musician, but not a violinist from God. But this is not a sentence at all, but a remark. We are talking only about comparing LSX with more expensive virtuoso models of the highest top rank from famous brands. Otherwise, everything is top notch. Without a doubt, this model deserves the closest attention. Well, about the price. 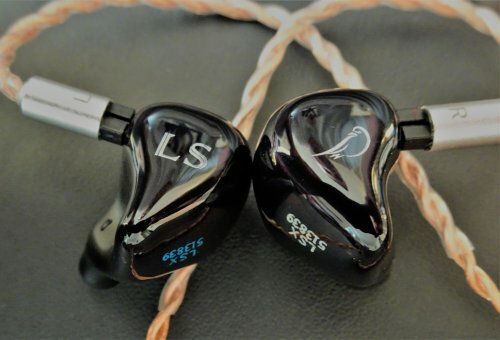 When ordering LSX on the website lark-studios.com depending on the version you order (IEM / CIEM), the LSX model will cost $1699. That is how much is a lucky ticket to the magical country of music. And in my opinion, this is a “burning tour”, which you should immediately go to. s_mugeche and B9Scrambler like this. 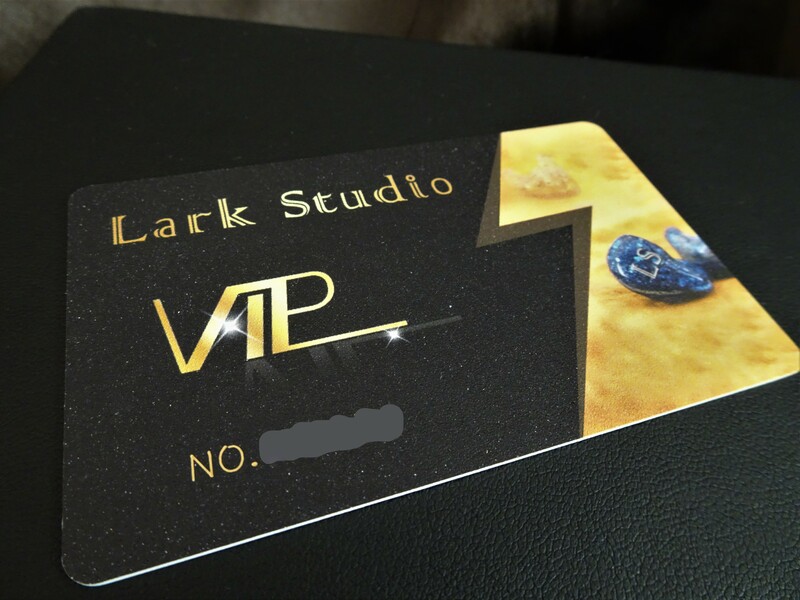 Lark Studios is a relatively young company, but only from a legal perspective. Their team has an enormous wealth of experience in the audio industry with some members having been around for over 15 years. It was created to service the worldwide desire for high-end, luxury-grade, audio products that never compromises on sound or aesthetics. 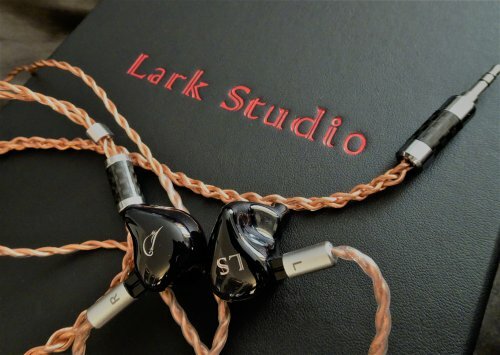 The Lark Studios X, or LSX for short, is their first IEM: a 10-balanced armature driver monster that perfectly personifies the values of Lark Studios. Want to get your hands on your own LSX? Shoot an email over to US@Lark-Studios.com and they’ll help you through the process. 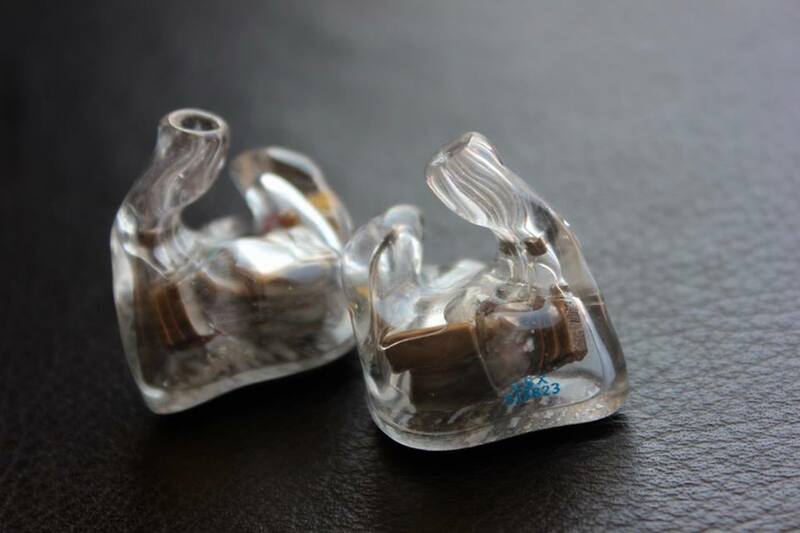 You can customize nearly every aspect of your IEM and even get the LSX built as a CIEM for no extra charge. 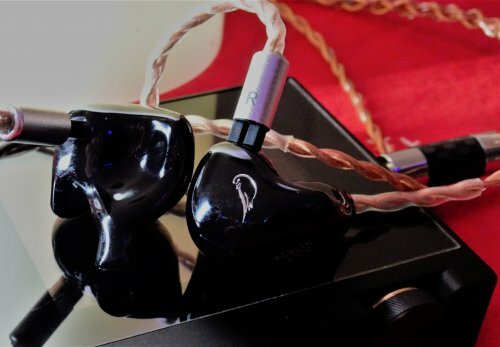 Both the UEIM version and CIEM version retail for $1699. They’re offering the first set of people who email them about the LSX a one-time discount, so get them while they’re hot! Lark Studios has put the LSX through several major sonic overhauls since I reviewed its first prototype. It went from being a somewhat thin-sounding treble cannon to a lush and natural-sounding IEM. 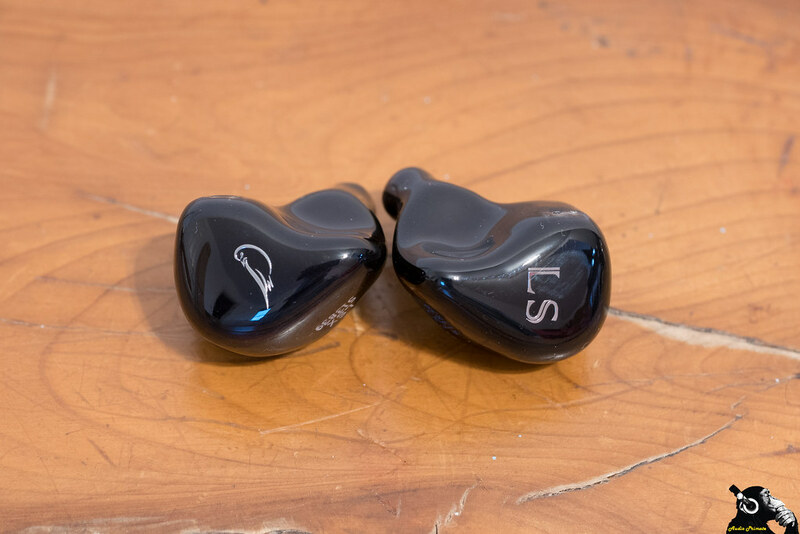 Unlike many other high-driver-count IEMs, the LSX focuses on ease of listening, not absolute “resolution” or achieving a perfectly flat frequency response. 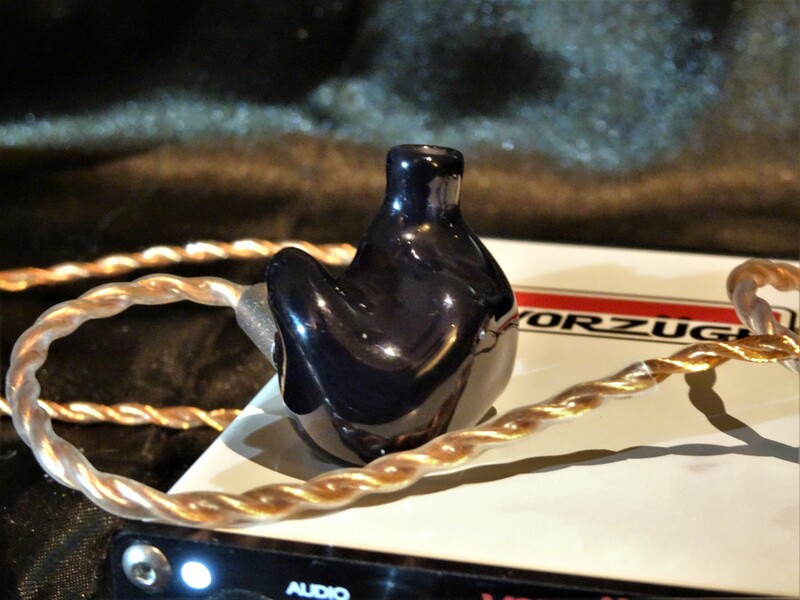 It has a mildly V-shaped frequency response optimized to produce life-like sound. The bass is elevated about 3dB past the midrange. The treble slopes steadily up from the upper-midrange, eventually reaching a peak in the upper treble. The lower midrange has some warmth to it, lending weight to much of the instrumentation within it. The LSX’s treble is a thing of beauty. It closely captures the energy of string instrumentation, percussion instruments, and synths, without generating a single iota of shrillness, sibilance, or sharpness. The LSX’s upper register easily captures the lively spirit of the high-hats and cymbals in Show Me How To Live [Live], even picking up steadily on the whistles and cheers of the captivated audience. In the intro of Little One, the LSX spaciously resolves the background sound-effects adding an immense sense of atmosphere that is hard to otherwise portray. The high-hats and cymbals of the drums maintained a regular and complete presence throughout the entirety of the song, never breaking, blurring, or otherwise losing their sonic integrity. Much like its treble, the LSX’s midrange is competent and enticing. A masterful manipulation of the four dedicated BA drivers in the LSX by its engineers has brought out what can certainly be considered a top-shelf instrumental experience. Everything from spatial placement to the attack and decay of complex texturing and resonation is fleshed out. The electric guitars in Flagpole Sitta are lively and full of crunch. Their dynamic timbre as heard through the LSX gives you the sense that you’re sitting right near Harvey Danger’s over-driven amp. Its high fidelity drivers let you hear many nuances in the tone of their guitars rather than reducing them to simple chords and generic distortion, a testament to the quality components being used inside the LSX. Lark Studios tuned the LSX’s bass to tow the fine line between maximizing bass quality and quantity given its exclusive use of balanced-armature drivers. I have to say, as someone who is immensely picky about their lower-register, I find no real flaws with the way the LSX is tuned. Bass drums kick with purpose and decay with impeccable ease. It's easy to see that a lot of attention was paid to the LSX’s bass when listening to War Pigs. You get about as much visceral slam from a BA-IEM as you can expect while also getting a completely uncompromisingly natural sound signature from top to bottom. Color me impressed. The LSX’s shells are made out of high-quality, medical grade, resin. 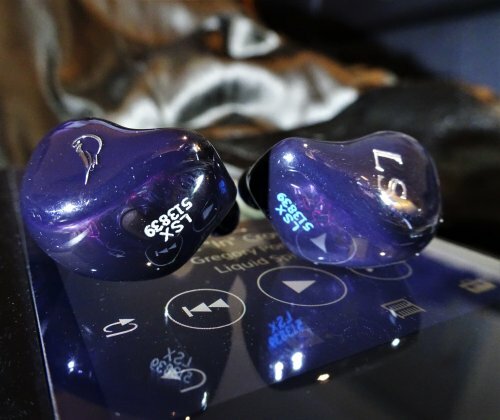 The standard edition of the LSX features a blue faceplate and shell with silver specks mixed into the faceplate. Given their varying depths, sizes, and reflectiveness, these specks create an interesting visual effect that is sure to catch the attention of onlookers. Lark Studios went with a dual-bore design for the LSX’s nozzles. They have an above-average length and have a good lip that prevents eartip slipping. The LSX features removable cables and follows the universal 2-pin standard. That means you can easily find aftermarket cables to suit your aesthetic or sonic preferences. The 2-pin cable that comes stock with the LSX is very snugly fitted so there’s no concern with the connectors falling out or slipping undone. The cable that I’ve received with my unit is not quite what is shipping to other customers and has some minor differences according to Lark Studios. However, given that this cable is still quite good I’ll at least make some comments on its build quality. My LSX’s cable is copper. It uses a simple chain geometry; each of the four cores is coated in a thick and sturdy layer of plastic. The Y-splitter is built out of a carbon-fiber tube capped with silver-colored metal, as is the chin-slider. 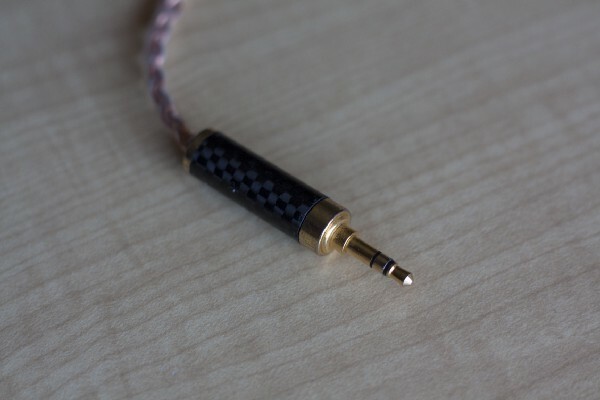 The 3.5mm jack uses the same carbon-fiber but instead has a brass-like metal at its ends. There is adequate stress relief at the base of the 3.5mm jack and no concerns of longevity. Be forewarned: your mileage with comfort will vary. Every person’s ears have a unique geometry, so keep that in mind. My ears are about average in size and do not have any notable quirks. I found the LSX to be very comfortable. 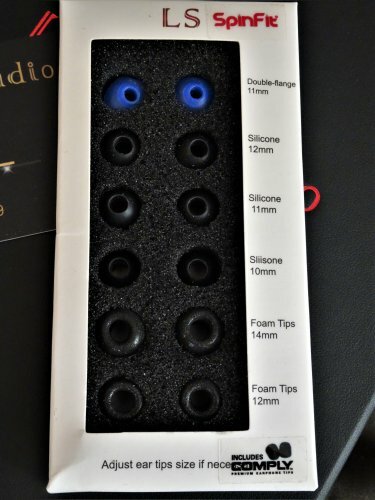 After slapping some of the included foam eartips on it I could easily achieve very good noise isolation. Surprisingly, I did not experience any discomfort from the shell during my extended listening sessions. 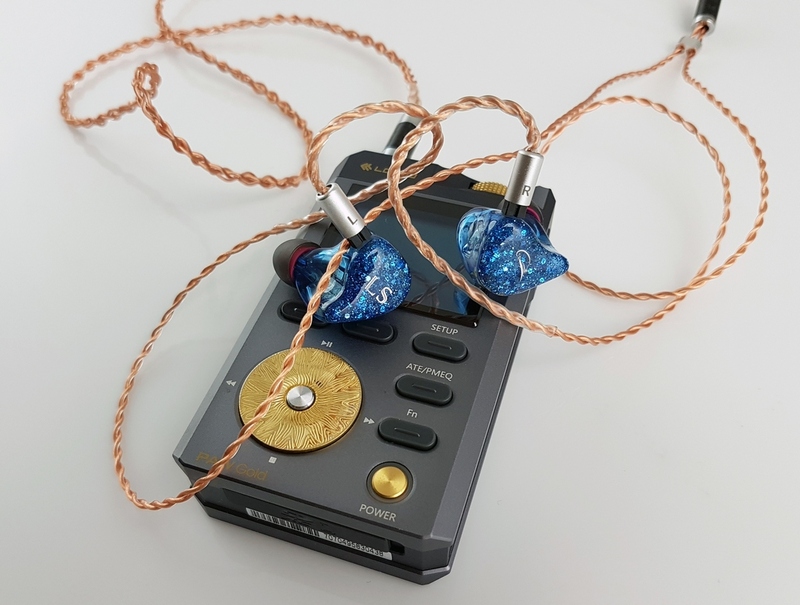 One would think that fitting 10 balanced armature drivers into a single IEM shell would make it ergonomically cumbersome, but alas, Lark Studios pulled it off. The LSX comes very well-equipped with accessories. 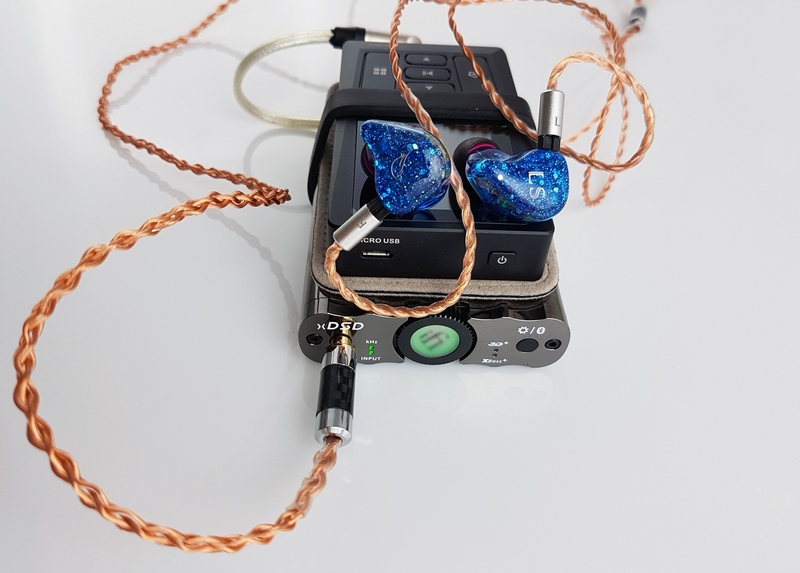 I did not find myself every needing something that didn’t come in the box to fully enjoy this IEM, and frankly, I was tempted to swap the extra eartips onto other IEMs of mine given their comfort and quality. The DAP bands were a nice touch, as was the inclusion of a soft carrying pouch alongside the carrying case. The case included is more useful as a display-piece or organizational tool than as something to safely transport a $1700 IEM. Truth be told, I’ll be transporting the LSX exclusively in a Pelican 1010 that I’ve added some additional foam padding to — wouldn’t want to risk such a high price item! The LSX, like many of its TOTL brethren, surpass simple questions of “does it have enough resolution” and “how well does it capture micro-details”. You can be confident that with a purchase of the LSX you are getting top of the line technical performance. All that’s left to see is how well you like its sound signature. 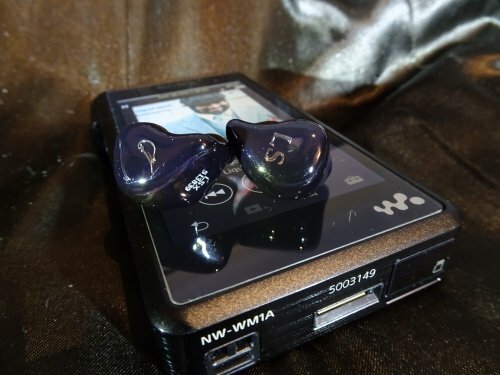 And, well, if you’ve ever enjoyed a V-shaped IEM its a sure bet that you’d enjoy the LSX too. I am blown away by Lark Studios’ first ever IEM and look forward to seeing what they can develop in the future! 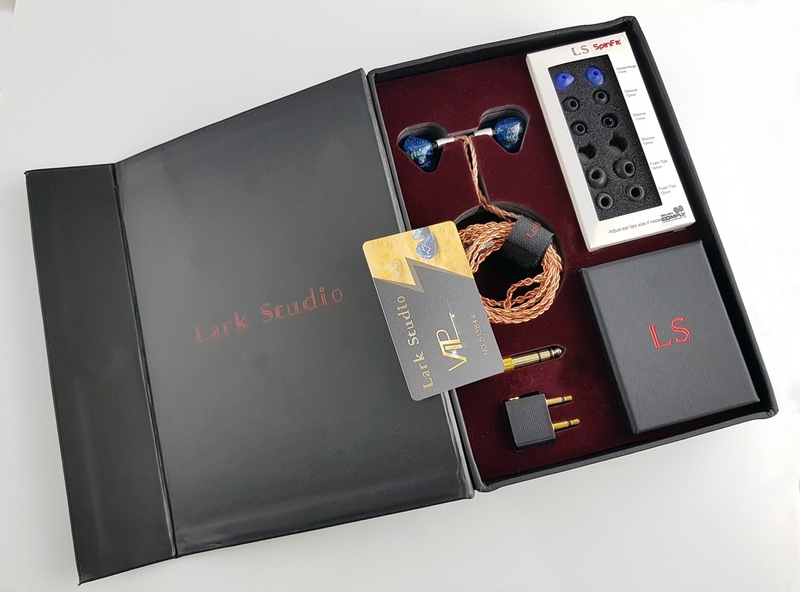 Lark Studio is a new audiophile company, but quite experienced in producing universal and custom products, they just released their first 10 balanced armatures model: LSX. "The lark is a well-known bird to the music industry. 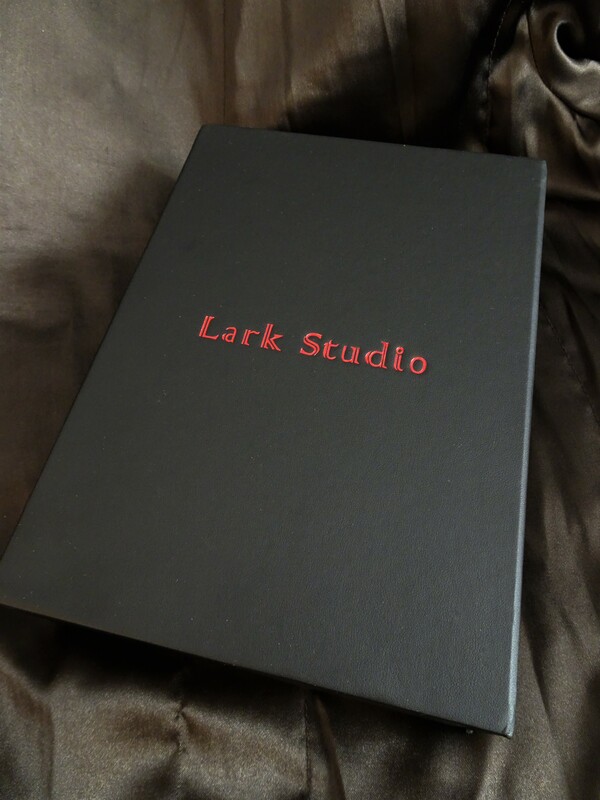 This is the story, and these are the values, of Lark Studios. We aim to provide you with a service that leaves you glad you did business with us. Happy reading!" Today, i am going to review their custom model, but i have had the opportunity to test their final universal prototype too. CLSX unit was sent me as a sample unit, I am not affiliated with the company and all observations and opinions will be only my own. Would like to thanks Lark Studio team for sending me this unit giving me the opportunity to test this engaging and nice-tuned IEM. 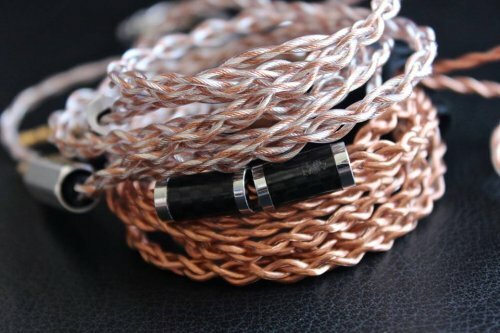 LSX will come in two versions: standard one, with a copper cable and a special version too, with PWaudio Saladin cable. They will offer their custom version at the same price of their universal one. From what i know, you can customize the artwork of both your universal and custom models without any additional cost, this is amazing and quite revolutionary. 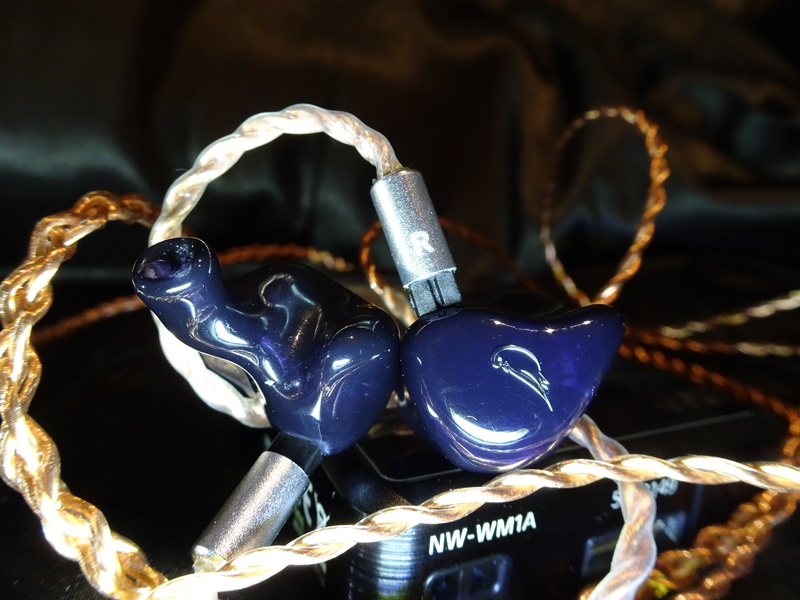 ( at the end of this review, you can find all the specs for standard cable and PWaudio Saladin one). For more info about lsx or many custom available artworks, you can easily ask to Michael or Arthur on their facebook channel. 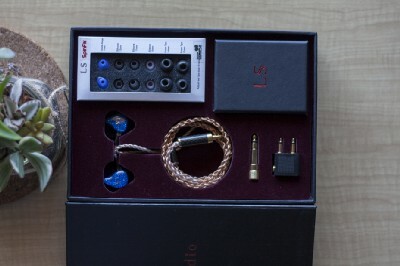 PACKAGING: usually, don’t like to write much about packaging and other feautures, cause my main focus is sound quality, but the package here, is quite premium and rich: in the large box you can find many adaptors, a warranty card, a soft pouch and other more accessories, that you can see in the picture above. Where, other companies uses only an hard case for their custom models, Lark Studio uses for both their universal and custom IEM the same premium box( in the universal model, you will find many SpinfFit and Comply eartips, i found a good isolation and great sound with the blue core SpinFit eartip). For the custom artwork, i choosed a wood faceplates, trasparent shell and their silver/gold logo. Build quality seems premium and sturdy, though the pin socket are a bit tight specially at the beginning( so pay attention when switching cables). Will update this review, if will find any build quality issue in the near future. SOUND: All my sound consideration has been made after 150 hours of burn in as suggested by Lark Studio company, with different DAPs such as AK KANN, AK se100 Futura, Opus 1s, Opus2, iFi Nano Idsd black label. 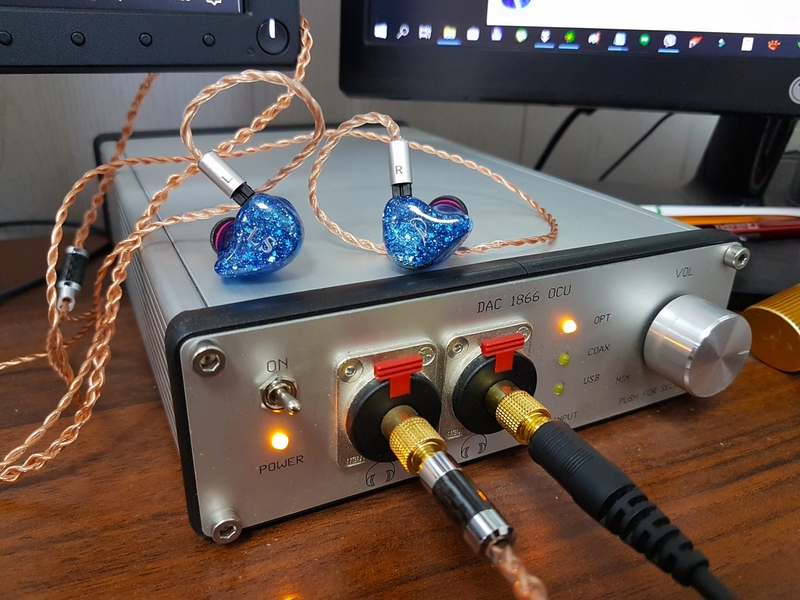 I really found a great improvement after 100 hours of burn-in( usually, i am not a great burn-in believer for multi balanced IEM, but for custom models it needs time to adjust to your ear-canal and consequently when the seal will be good, perceived sound will improve. At this point, i don’t know if the great improvement i found, was due to only the better seal or the burn-in driver, but just to be sure, i suggest to make always a 50/100 hours of burn-in, before judging the overall sound quality. LSX is quite a neutral, but still engaging iem, and was quite impressed by the refined tuning. Lark Studio created a nice combination of engaging and neutral sound with sweet female vocals. 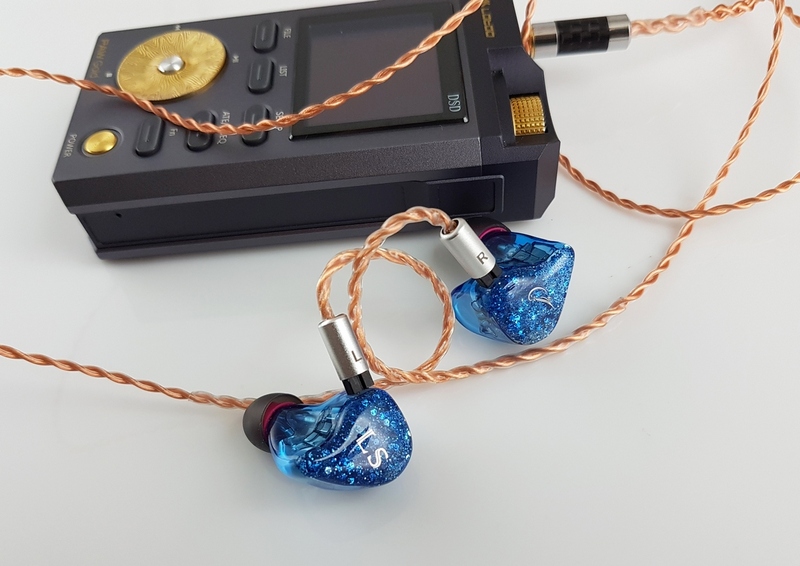 Bass is for sure, a strong point of this IEM: last time i heard such a quality bass response was with the Rhapsodio Galaxy V2(dynamic driver). Usually multi-balanced IEMs cannot compete in bass quality with dynamic drivers models, but here bass goes very deep, with great sub-bass extension, mid-bass has adequate presence, but never warms up too much the scene. The overall result will depend on the source too, for example this LSX with ak se100 Futura really shines, giving a great punchy and layered bass response. Vocals are a bit behind, but have nice tonality and realism, here again this iem has a great sinergy with astell and kern player, cause se100, usually, tends to push vocals more forward. There is a peak on the high-midrange area that creates a great balance with the strong bass response. Both male and female vocals are well portrayed, but feamale ones are really sweet and refined. Listening to Yael Naim or Cèlin Dion on this LSX was a pleasure for my ears. Treble is clean and well extended and sometimes, will give you some sparkles, but never resulting too harsh or hot. Soundstage is quite wide and holographic with the right tracks, but i found the universal model to have a wider soundstage(my custom model fits very deep in my ear-canal, so it can changes the overall perceived soundstage). 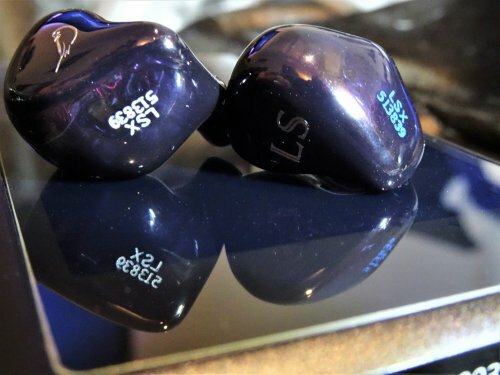 This LSX is quite easy to drive, but is not the most sensitive IEM out there, so needs a bit of current to really shine. Overall with good players such Opus 2/1s and ak se100 you will have a great result. the standard copper cable will give you a warmer sound, with more focus on bass and vocals(nice with modern and pop music), on the other side Saladin has always a smooth approach with more organic vocals, but will give you a better balance of mid-bass and upper treble( i would say a more audiophile approach). Overall Saladin has a more refined and sweet sound, with better transparency and resolution. I would suggest you to go with the standard edition, if you love a warmer sound with a more focus on bass response. 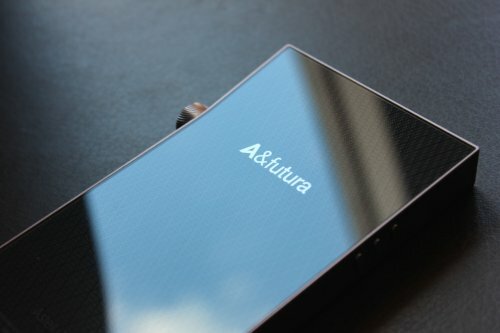 LSX and Astell and kern SE100: great sinergy, with deep and airy bass response, vocals results more sweet and more forward. Soundstage results a bit more intimate and less wide compared to Opus2, but there is better depth layering. 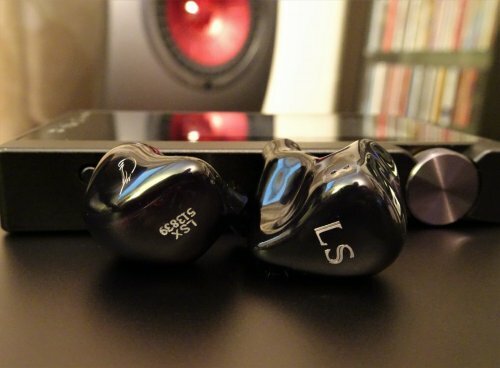 LSX and OPUS2: bass doesn’t go deep as ak se100, but acquires more rumble and mid-bass presence. Vocals are not forward like SE100, but are still sweet with good tonality. Soundstage is wider and more holographic, but is less deep. I can easily drive this IEM on mid-gain without any issues. 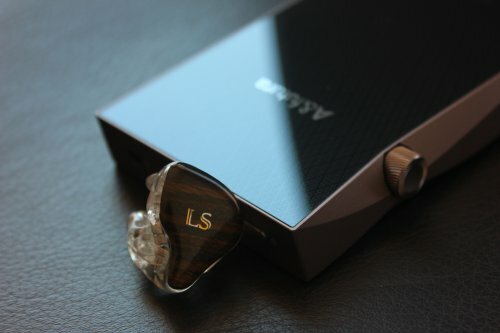 LSX with Opus1s: Opus 1s is a bit more full-bodied than Opus 2, less neutral, with a warmer and punchier bass response. Vocals are not so weet and detailed like for SE100 and Opus 2. Soundstage is less wide and layered, but there is great left/right channel separation. 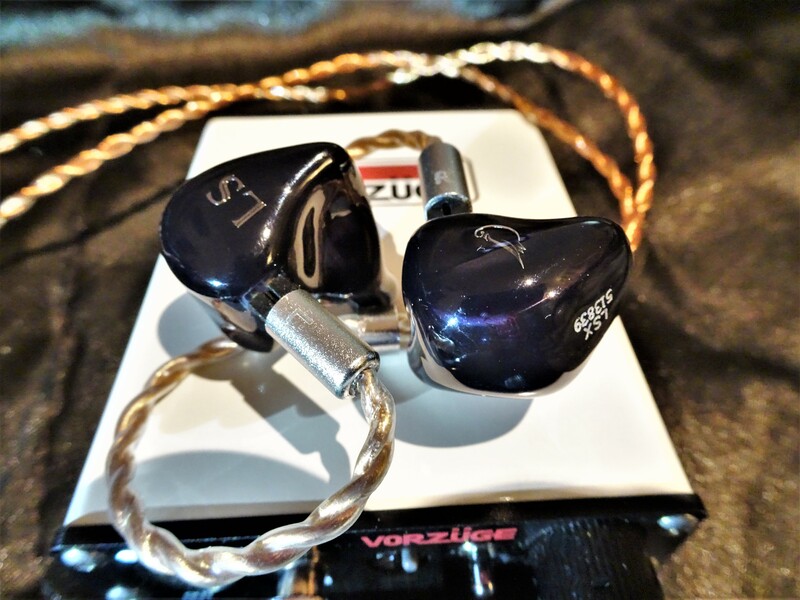 INEARZ EUPHORIA CUSTOM VS LSX: lsx has better treble response and upper-mid presence, for this lsx, is capable to show a better female vocals. Euphoria has good bass response, but doesn’t go deep as Lsx can do. Soundstage is more or less on par. 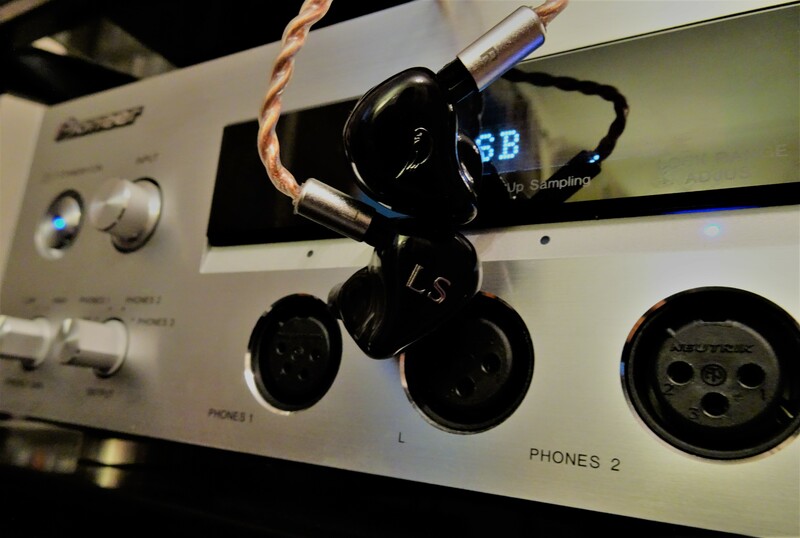 Overall INEARZ EUPHORIA, sounds a bit smoother and less fatiguing, but LSX has better bass response and is capable to combine an engaging and natural sound in a better way. CONCLUSION: this LSX was quite a surprise for me, wasn’t expecting such a refined tuning abilities from Lark Studio engineers and giving the opportunity to their customers to choose artwork customization for both their universal and custom product without any additional cost, will be for sure a winning choice for this new/big company. 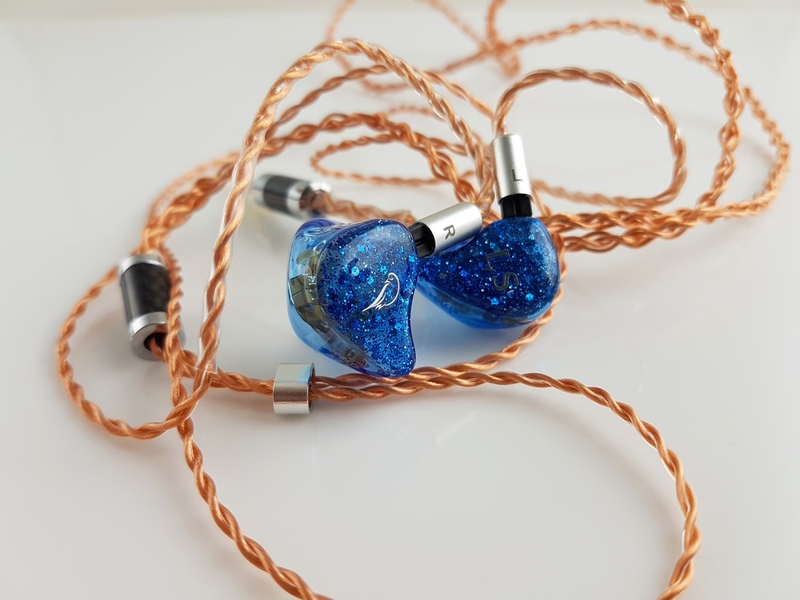 tapping on his vast experience with copper based and silver based cables, Peter Wong has set out to create a new range of products, known as the "Vanquish" series, to mark a new era of PWaudio products. 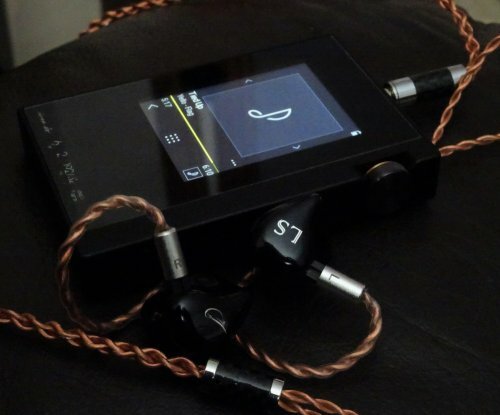 Featuring a unique geometry and wire design based on his "Sevenfold Pipe" series, together with his knowledge of different types and grades of cable materials, PWaudio has created the Saladin. Saladin features an all new 7 bundle Litz geometry of copper and silver-plated copper. 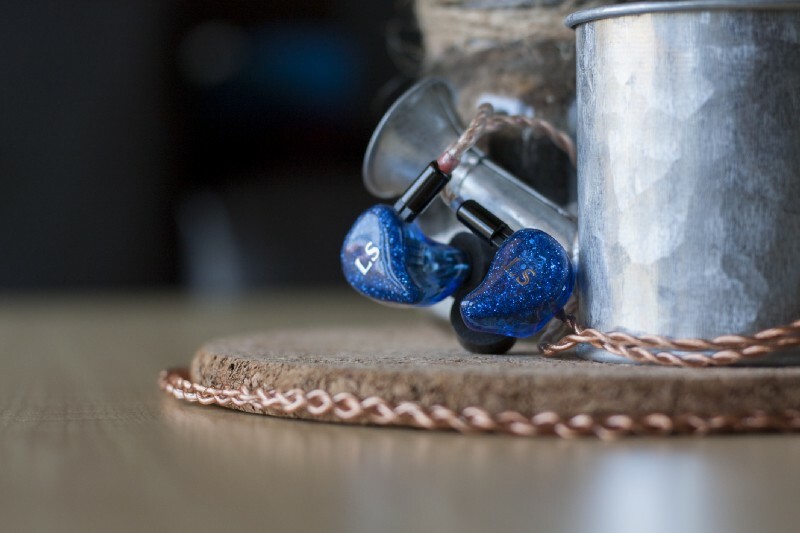 Drawing from the characteristics of the copper, Saladin presents a vast, yet warm sound that draws the listener in with its intimacy and smoothness, and which also takes advantage of the SPC to present a detailed treble that provides added resolution and energy. Cinder and Arthur Feng like this.